Congenital spinal dermal sinus tract has been a well-recognized entity for many decades. 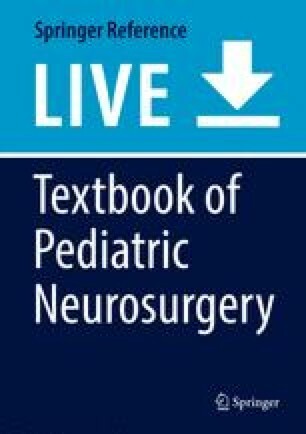 Moise first described a case in 1926, Walker and Bucy coined the term in 1934, and Mason devoted a chapter to it in the first textbook of pediatric neurosurgery published in 1959 (Matson 1959; Wang et al. 1993). There are more than 10 case series of CSDST published since 1993 focusing on different clinical perspectives (Table 1) (Wang et al. 1993; Elton and Oakes 2001; Jindal and Mahapatra 2001; Ackerman and Menezes 2003; Lee 2005; van Aalst et al. 2006; Radmanesh et al. 2010; Martínez-Lage et al. 2011; De Vloo et al. 2013; Mete et al. 2014; Singh et al. 2015; Tisdall et al. 2015; Girishan and Rajshekhar 2016; Venkatesh et al. 2018). It is known to be associated with other anomalies especially split cord malformations and spinal cord lipomas. All 9 pediatric had ostium. 1 adult had no ostium. In contrast, LDM is a more recently defined entity. The senior author (DP) first used the term in 1992 while describing lesions associated with split cord malformations, again in 1993 to designate a cystic form of cervical dysraphic malformation, then finally published a comprehensive report on this entity in 2010 (Pang et al. 1992; Pang and Dias 1993; Pang et al. 2010). In it, the relationships between LDM and other congenital anomalies such as spinal cord lipomas, split cord malformations, and meningocele manque are discussed in detail. It has since become apparent that other dorsal spinal cord tethering lesions rather imprecisely called “nonepithelial long tethering tract”, “dermal-sinus-like stalk,” and “pseudo-dermal sinus tract,” described between 2007 and 2013, are in fact variant forms of LDM (Rajpal et al. 2007; van Aalst et al. 2009; Cornips et al. 2011; Martínez-Lage et al. 2011; De Vloo et al. 2013). Finally, since 2013, there have been reports of mixed forms of LDM with CSDST, and LDM with dermal elements (Pang et al. 2013a; Eibach et al. 2017; Lee et al. 2018). In a related note, congenital dermal sinus unrelated to primary neurulation failure can occur in the lower sacral and coccygeal region. They are mostly the so-called simple sacral dimples and coccygeal sinuses or pits, whose internal parts only extend to the deep fascia and not beyond, thus are of little neurosurgical concern (Weprin and Oakes 2000; Elton and Oakes 2001). Primary neurulation, the formation of the primary neural tube – the primordium of the brain and the spinal cord down to the S1 level – consists of four main stages occurring sequentially at each axial level of the embryo. They are: (1) Formation of the neural plate, (2) shaping of the neural plate, (3) bending of the neural plate, and (4) closure of the neural groove (Colas and Schoenwolf 2001). Closure of the neural groove starts at the hindbrain/upper cervical region in humans and propagates both rostrally and caudally (Colas and Schoenwolf 2001). 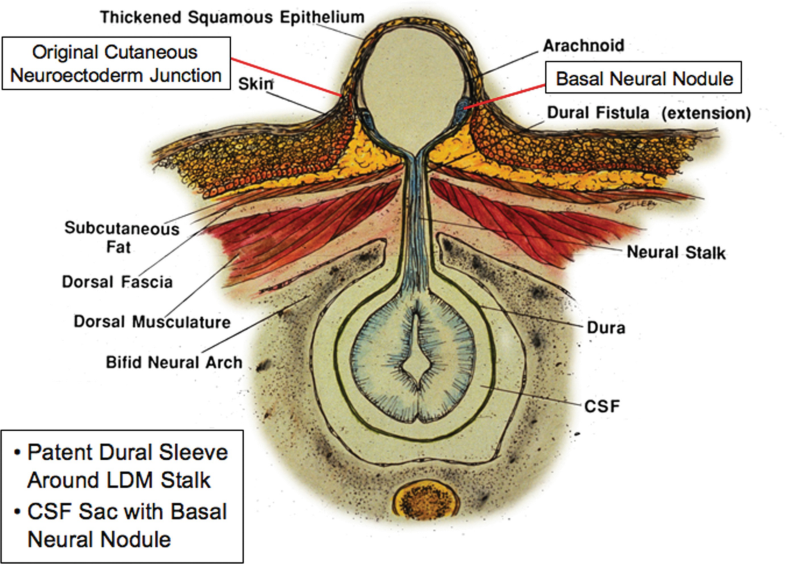 During this stage, fusion of the neural folds and complete separation of surface epithelium (SE) from neuroepithelium (NE) take place at the dorsal midline. It consists of a complex sequence of events at the tissue level which occur in an overlapping manner that cannot be unlinked from the preceding stages, i.e., bending of the neural plate, formation of the paired neural folds, and their convergence towards the dorsal midline (Martins-Green 1988; Schoenwolf and Smith 1990; van Straaten et al. 1993; Colas and Schoenwolf 2001). The sequence of events are as follows (Fig. 1) (Martins-Green 1988; Schoenwolf and Smith 1990; van Straaten et al. 1993 and 1996; Colas and Schoenwolf 2001): (1) The formation of an overlapping SE and NE junction: When the neural plate is first formed, NE cells and SE cells lie side by side on the same plane at the border of the neural plate. As the paired neural folds progressively elevate and converge towards the dorsal midline, the NE cells enlarge in height and drag the flattened SE cells onto their dorsal surface. In effect, the two epithelia are connected over a broad, overlapping surface of several cells’ thickness. (2) Delamination: An interepithelial space then gradually develops in the middle part of this broad interface of the two epithelia. The basal lamina of the two epithelia however remains continuous at the ventral point (ventro-lateral extreme of their contact). Thus, when the interepithelial space expands, it acquires a crescent shape. As the two neural folds approach each other to close the dorsal midline gap, the interepithelial space extends further dorsally towards the dorsal midline. The basal lamina bridge at the ventral contact point of the two epithelia also gradually breaks down, and the two epithelia become separate ventrally. A new basal lamina then forms on the “interepithelial surfaces” of the two epithelia. When the interepithelial space reaches the dorsal-most meeting point of the two epithelia, the epithelia separate completely, thereby consummating the process known as disjunction. (3) Fusion at the dorsal midline: Fusion of the SE and NE layers with their respective counterpart on the opposite side of the midline takes place simultaneous with delamination/disjunction. Fusion is preceded by apposition of the two opposing sets of epithelia at the tips of the two neural folds, followed by intercellular adhesion at points of contact. The initial contact areas are often discontinuous from superficial to deep (Silver and Kerns 1978), and it is likely that fusion of the two epithelial layers proceeds independently of each other (van Straaten et al. 1993). Schoenwolf, using chick embryos in 1982, concluded that fusion completed first in the SE (Schoenwolf 1982). However, van Straaten in 1993, also using chick embryos, demonstrated that there was no fixed priority of completion of fusion in the two layers (van Straaten et al. 1993). It is obvious that the final steps of delamination (disjunction) and fusion of the two epithelia are topographically and chronologically closely related, but the fine details of their interrelationship are still not fully elucidated. What is well established is that in normal embryos, complete closure of the neural groove at any axial level is marked by the presence of a continuous basal lamina under the SE across the dorsal midline and a continuous sheath of basal lamina around the NE (primary neural tube) at that level (Martins-Green and Erickson 1987). 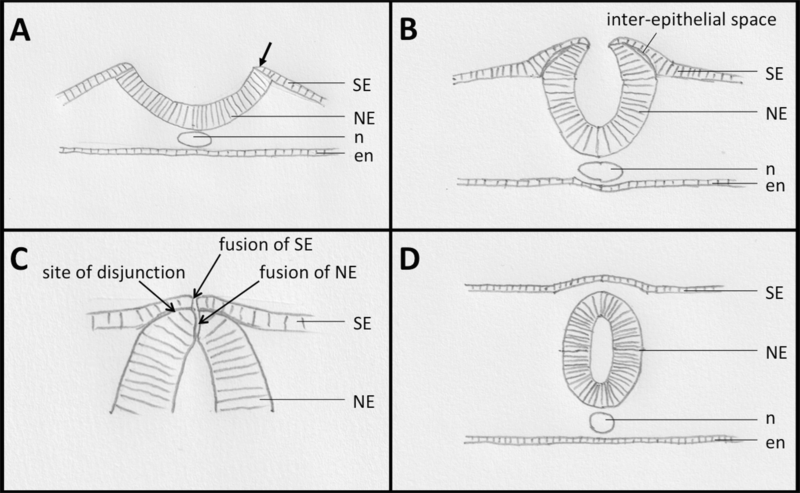 It is possible that fusion of the epithelia at the dorsal midline and their delamination/disjunction are independent of each other, but intuitively, fusion of the epithelia must occur before final delamination (disjunction) of the SE and NE. The answer may have to rely on dynamic observation at the ultrastructural level. Given the intricate cellular events in the final phases of neural groove closure, faults may occur at a focal dorsal point of the developing primary neural tube to give rise to failed or incomplete fusion and nondisjunction of a small, focal, or “limited,” segment anywhere along the future spinal cord as caudal as the S1 cord level. A LDSND differs from the exposed, totally flat, and unclosed neural placode of an open myelomeningocoele only in the degree of incompleteness of neurulation (Pang 2006). In LDSNDs, most of the steps of primary neurulation including elevation, in-folding, and recognition of the dorsal neural folds have occurred except for the final phase. The basic configuration of the neural tube has taken shape, except for a thin slip in the dorsal midline. Several anatomical phenotypes are seen in the final malformation, depending on the aberrant behaviors of the different primordial cells involved in the three key component steps of neural groove closure, i.e., delamination/disjunction of the two epithelia, fusion of the SE, and fusion of the NE. Thus, individual or combined errors of the primordial SE and NE cells, mesoderm and neural crest cells will ultimately determine the matured features of the subtype malformations under the aegis of LDSND (Fig. 2) (Schoenwolf and Smith 1990; Selleck and Bronner-Fraser 1995; Theveneau and Mayor 2012). CSDST: When the SE fails to fuse at a focal point, but the underlying NE has acquired intercellular adhesions across the dorsal midline, and disjunction does not occur, a CSDST develops. In this situation, closure of the primary neural tube is unhindered, but because local disjunction never happens, the gapping SE is persistently linked with the NE in a very focal area. The midline gap between the converging SE and dorsal scleromyotomes from opposite sides of the embryo remains very narrow. Further unimpeded development of the otherwise normal full-thickness dorsal myofascial tissues around the midline strip progressively sets the primary neural tube away from the surface and deeper into the body, where it ultimately assumes its primarily intraspinal location. A dorsal median tract of SE tissue, however, retains as the original link between the closed neural tube and the still slightly gaping surface. Anchorage of the tract on the SE side is firm because its component cells are still essentially part of the surface epithelium, but its deep end may not be firmly attached to the NE cells after closure of the neural groove. Cellular movements during normal development of the scleromesoderm, meninges, and neural crest cells could have dislodged the tract from the underlying neural tube, so that the inner anchorage of the tract may end short of the spinal cord but on the meninges or even the musculofascial layers. LDM: When the NE fails to fuse at a focal point but the overlying SE has acquired intercellular adhesions across the dorsal midline, full disjunction also does not occur. Similar to the preceding situation but in reverse, the SE gap is closed, but because local NE fusion and disjunction never happen, the NE is persistently linked with the SE in this very focal area; the midline gap between the converging NE and dorsal scleromyotomes from opposite sides of the embryo remains very narrow. Further unimpeded development of the otherwise normal full-thickness dorsal myofascial tissues around the midline strip progressively sets the neural tube away from the surface and deeper into the body, where it ultimately assumes its primarily intraspinal location. 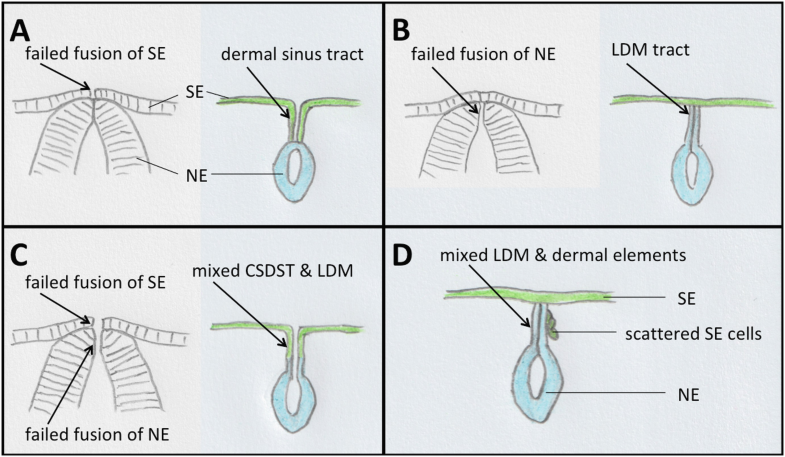 A dorsal median tract of NE tissue (versus SE tissue in CSDST), however, retains as the original link between the focally gapping neural tube and the closed SE (Pang et al. 2010). The anchorage of the tract on the undersurface of the SE affects the integration of mesodermal tissue to form normal skin at that focal area. Mixed LDM and CSDST: When both the SE and NE fail to fuse and disjunction does not occur, a midline tract as in the above two entities develops, but the inner portion of the tract consists of NE tissue while the outer tract contains mainly SE. The relative proportion of the two kinds of tissues depends on the “pulling forces” during embryogenesis. Mixed LDM and dermal sinus tracts are rare but may easily elude detection (Lee et al. 2018; Eibach et al. 2017). LDM with scattered dermal element: As for those LDMs with dermal elements, but without a sinus tract, the origin of the dermal elements could be from pluripotent cells near the midline surface, or from SE cells somehow included in the LDM stalk during its ventral movement (Pang et al. 2013a; Eibach et al. 2017). LDSND with spinal cord lipoma: LDMs have been known to be associated with dorsal lipomas, either directly adjacent to the lipoma stalk or continuous with it. Since both dorsal and transitional lipomas are thought to arise from premature disjunction due to faulty end-stage neural groove closure, it is not surprising that nondisjunction disorders may coexist (Pang et al. 2013a). Equivalent parallel defects may also explain the coexistence of lipomas and CSDST. LDSND with split cord malformation: It is conceivable that the fibroneural stalk or sinus tract found in some cases of split cord malformation are in fact the persistent dorsal remnant of an anomalous ecto-endodermal fistula formed during early gastrulation (Pang et al. 1992; Pang 2006). The hallmark of a LDSND is the presence of a tract linking the spinal cord at or above the S1 spinal cord level to the dorsal midline skin. 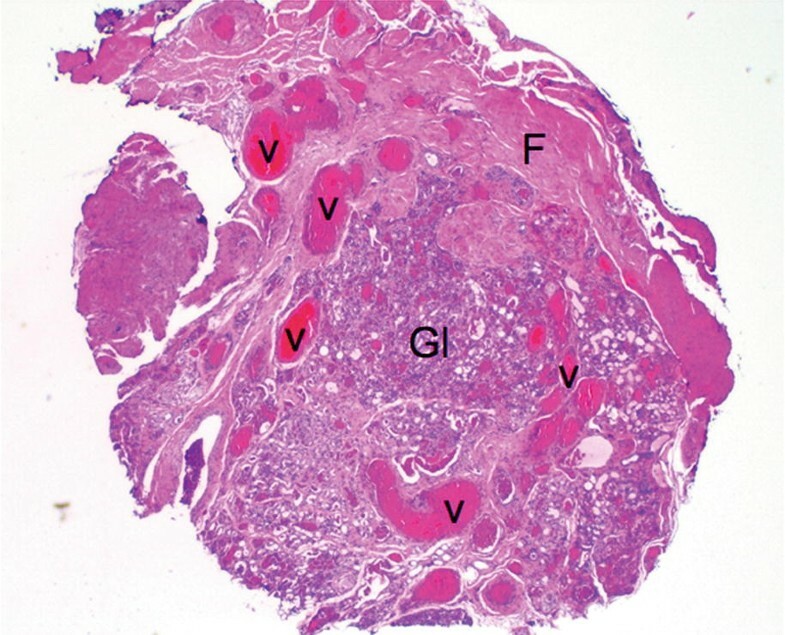 Variations in the exact histological architecture explain the spectrum of nondisjunctional entities, and partial atresia of the tract may account for certain variants of the full forms (Hiraoka et al. 2018). 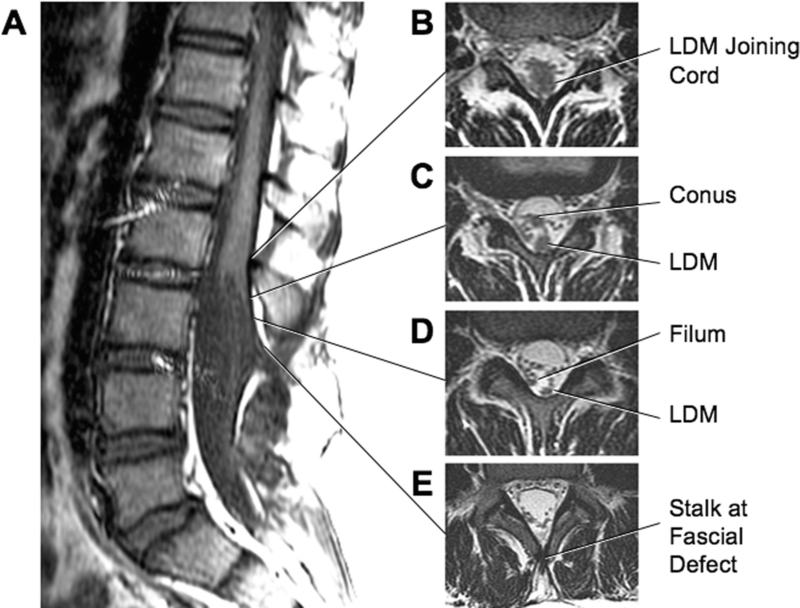 For purposes of archiving, the “level” of a LDSND should be the same level of the laminar defect the fibroneural stalk passes through, which likewise localizes to the corresponding spinal cord level where the initial nondisjunctional error occurred. 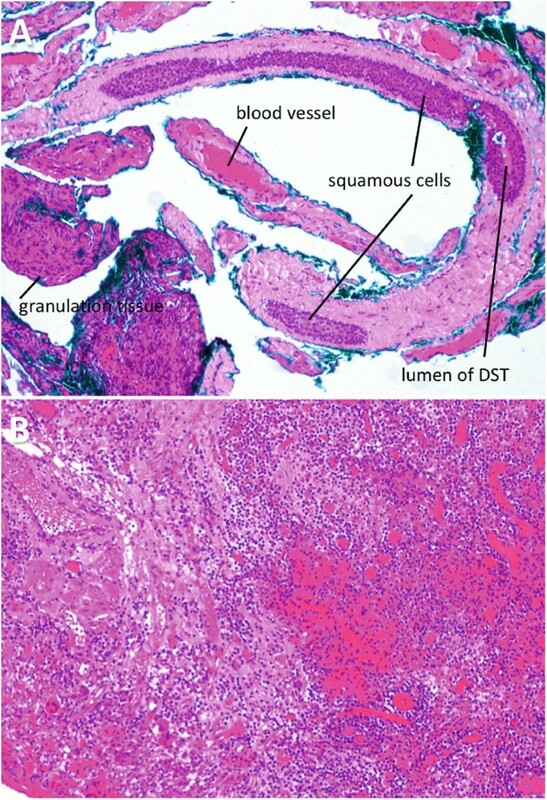 The essential feature of a CSDST is the presence of a dorsal midline sinus tract – a hollow tubular structure lined by squamous epithelium (van Aalst et al. 2009; Martínez-Lage et al. 2011). It is the direct derivative of the SE nonfusion defect. The size of the surface opening (ostium) of this tract is variable but usually small (Fig. 3). It always leads to a deeper part of unpredictable length (Figs. 4, 5, and 6). Over 60% end intradurally and some can be firmly adherent to the spinal cord (Table 1). 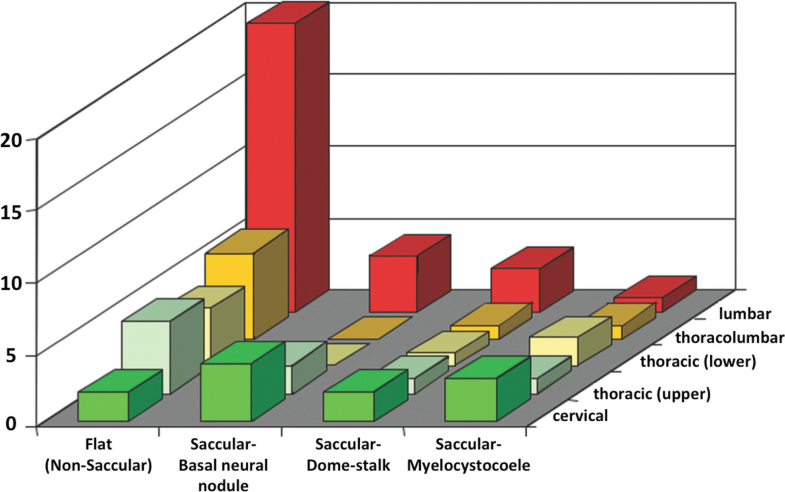 Over 60% of CSDSTs are located in the lumbosacral region, the rest are scattered in the cervical and thoracic regions (Table 1). Because the spinal cord ascends for a fair distance along the vertebral column during the perinatal and early postnatal periods due to their discrepant growth rates, the shape of the sinus tract also varies depending on its level of origin. 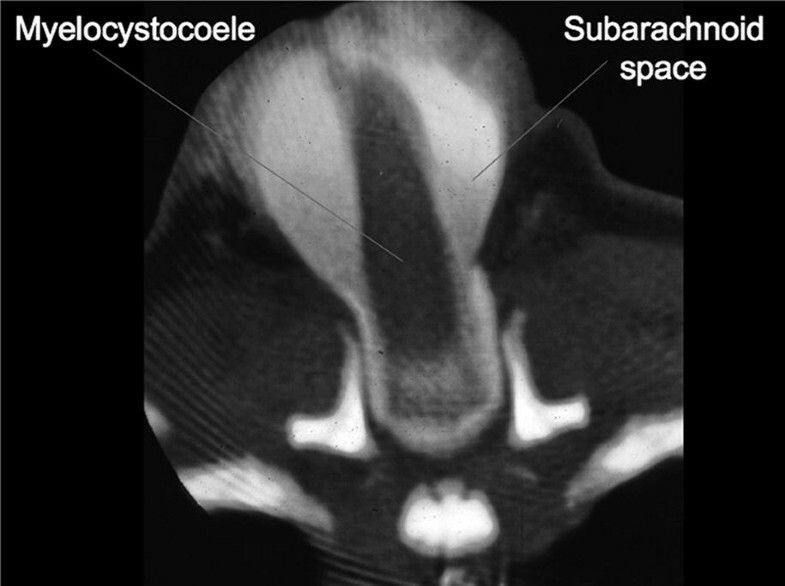 A lumbosacral sinus takes on a V- shape with the apex pointing at exactly the laminar level of its embryologic error and from thence the tract ascends towards the dura. The subcutaneous tract becomes progressively more horizontal with higher lesions until it points upwards towards the dura in cervico-thoracic lesions. At the skin level, the sinus ostium is sometimes accompanied by other skin stigmata (Fig. 3). At the laminar level, the tract may go through a bifid spinous process or lamina, or through the interspinous ligament. It then enters the dura but can also travel between the dural sleeves for a short distance before becoming intradural. Within the thecal sac, it may be adherent to the filum or nerve roots and, as a rule, one should assume all sinus tracts reach the spinal cord until proven otherwise. 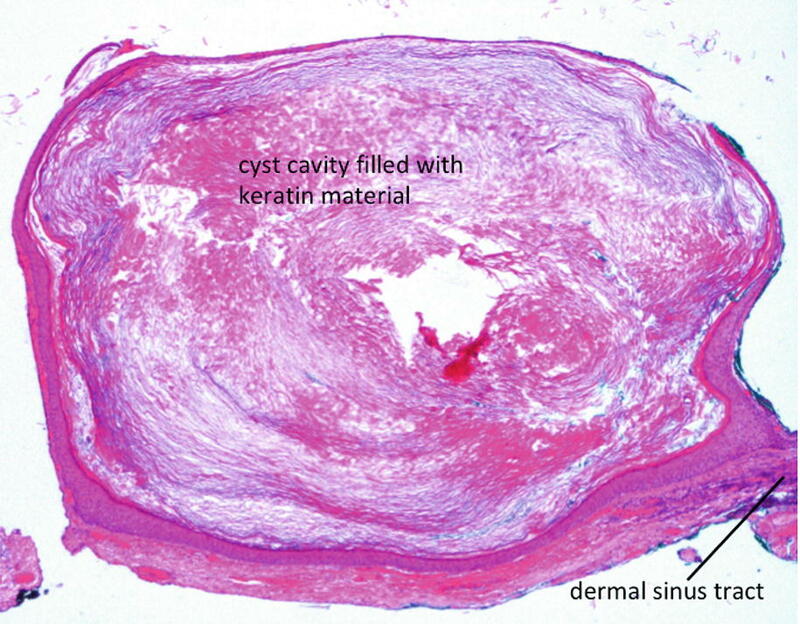 Anywhere along the sinus tract, existing keratin material may develop a dermoid cyst, which can be intramedullary (Fig. 7). In a report of 10 spinal intramedullary dermoid cysts, 9 had a traceable CSDST (Girishan and Rajshekhar 2016). The rare absence of a CSDST in these cases is probably due to atresia of the outer tract or isolated sequestration of pluripotent SE cells (Hiraoka et al. 2018). Histologically, a CSDST is lined by keratinizing stratified squamous epithelium (Fig. 8). Hair shafts and follicles are present in variable abundance. Mesenchymal derivatives including blood vessels and fibrous tissue are seen in the periphery (Figs. 8 and 9). Occasionally, nerve fibers are present. The lumen of the tract and cavity within dermoid cysts are filled with keratin material (Fig. 10). In some cases, a lumen may only be patent in part of the tract (Fig. 9). In slender tracts, a transitional zone of epithelial to nonepithelial tissues near the tract’s inner end can be observed (Fig. 11). 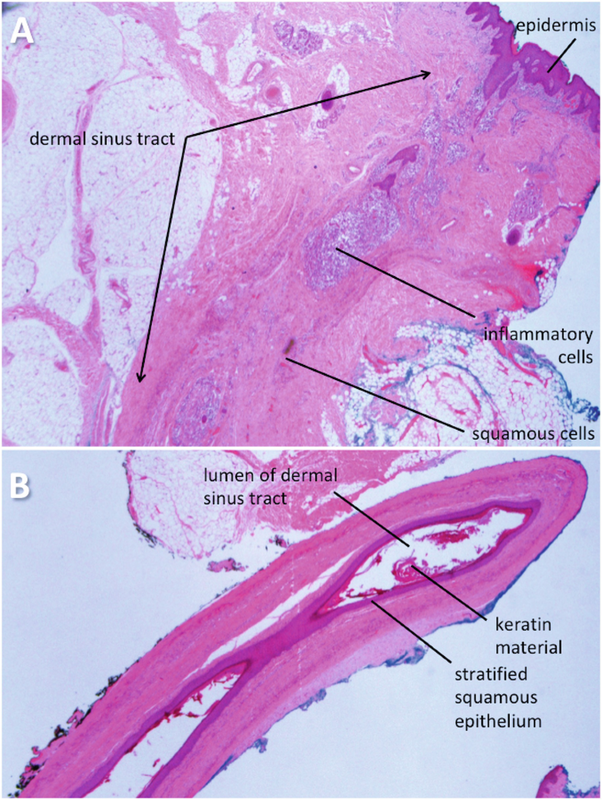 Because of the communication with the skin surface, open sinus tracts are prone to bacterial infections and chemically induced inflammation from keratin accumulation. 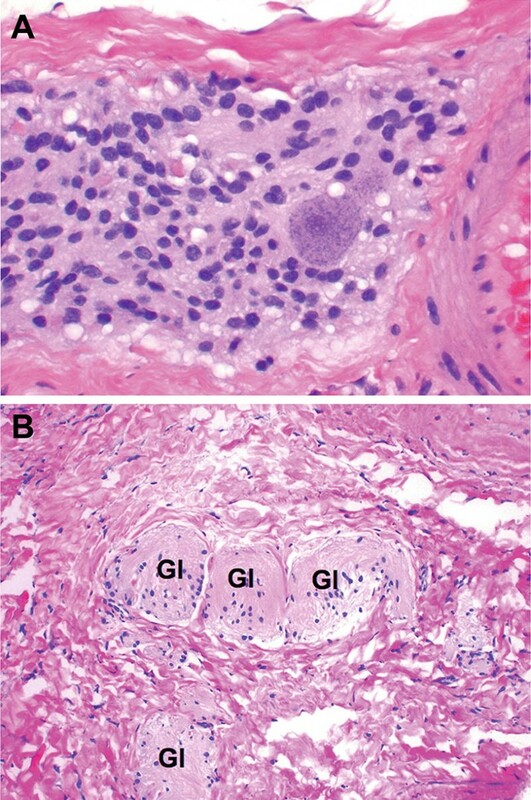 Thus inflamed granulation tissue containing mixed lymphocytes, plasma cells, histiocytes, and neutrophils is a consistent finding within the CSDST (Figs. 8 and 9) (Martínez-Lage et al. 2011; De Vloo et al. 2013; Tisdall et al. 2015). The mean age of presentation is 3 years or below in most series, and 10 or below in all recent series. However, the age range is wide, with some patients first diagnosed in their 30s or even 50s (Table 1). Patients commonly present with skin stigmata, usually a cutaneous pit, frequently associated with haemangioma, pigmentation, skin tag, hypertrichosis, or subcutaneous lipomas (Fig. 3). The presence of the last two skin stigmata should arouse the suspicion for an associated split cord malformation or spinal cord lipoma. Neurological deficits involving the bowel and bladder and limbs are not rare and in many published series occur in over 40% of patients. Neurological deficits may develop catastrophically in infected cases and in patients harboring large intradural dermoid/epidermoid cysts (Table 1). In clinical practice, a definitive history of discharge from a sinus ostium is uncommon, seen only in 25% of cases, and inflamed skin around an obviously infected ostium or a deep seated abscess is even rarer, occurring in less than 15%. Paradoxically, active meningitis or a history of recurrent meningitis is reported in up to 40% of cases in some series (Table 1). All LDMs share two constant features, namely, a cutaneous signature and an internal fibroneural stalk connecting the skin lesion to the spinal cord (Fig. 12). The cutaneous signature, a pearly crater of abnormal epithelium, commonly called a “cigarette-burn mark,” is caused by changes in the SE cells overlying the original site of nondisjunction (Fig. 2). The fibroneural stalk, beginning from the underside of the abnormal skin, ultimately merges with the spinal cord in all instances. In all cases, the attachment point is above the conus, indicative of this being a primary neurulation defect (Pang et al. 2013a). Only one case with a discontinuous stalk has been reported (Hiraoka et al. 2018). The fibroneural stalk, like the tract of a CSDST, has a V-shaped path on the sagittal plane when it is in the lumbosacral region, and becomes progressively horizontal or angles upwards with more cranial lesions. LDMs can be classified according to the appearance of the skin abnormality into either flat (nonsaccular) or saccular (Fig. 12). The flat LDM is recognizable either by a crater like patch of “nonskin” squamous epithelium or by a simple pit. 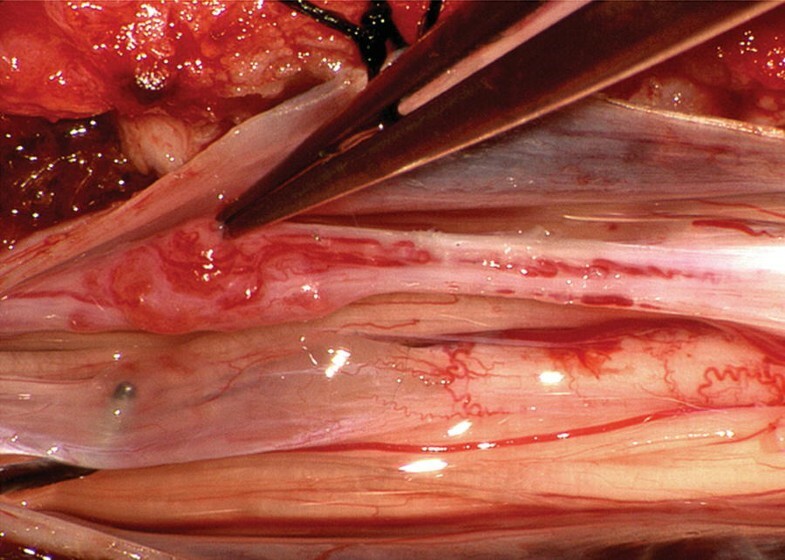 Internally the fibroneural stalk runs through a small defect in the deep fascial layer and a bifid lamina towards the dura (Fig. 13a–e). 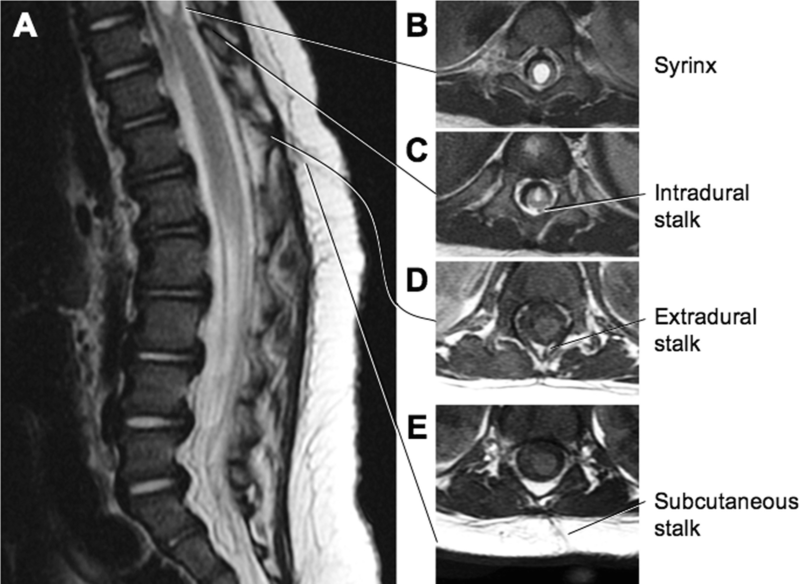 On magnetic resonance imaging (MRI), the intradural stalk of a lumbar lesion is seen as a round structure separate from the filum and, more rostrally, separate from the conus (Fig. 13a), except where it joins the spinal cord to give it a trapezoid shape at the stalk-cord union, always at a level above the conus (Fig. 13b). In most lumbar lesions, the extradural stalk descends caudally from the skin lesion and then ascends towards the spinal cord after dural penetration, giving the tract a V-shape course on the sagittal MRI (Fig. 14). In thoracic lesions, the tract takes a straight slant upwards to meet the cord (Fig. 15). Some fibroneural stalks are stout and its tethering effect to the cord is very obvious (Fig.16). 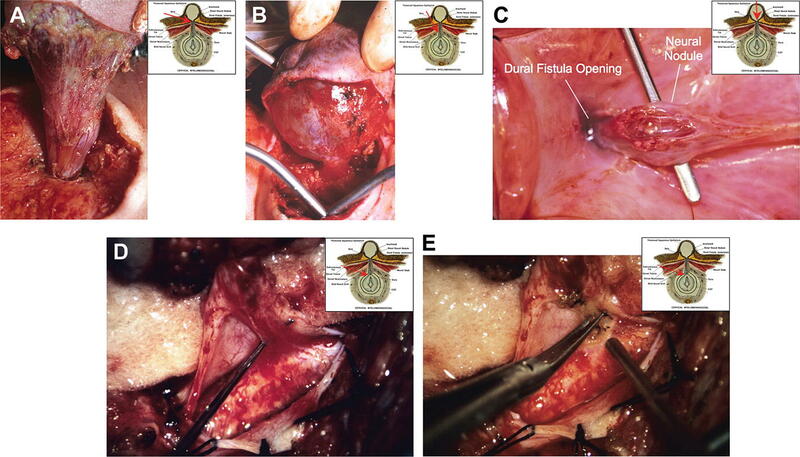 In others, the tension in the stalk is illustrated by a dorsally tented thecal sac at the point of dural penetration, and often the cord is also tented dorsally at the stalk-cord union (Fig. 17). Rarely, the cord appears to be archly pulled dorsally towards the skin crater to the extent it seems to have displaced the overlying bone and myofascial layers (Fig. 18). In all these examples, the apparent dynamism of the tethering is obvious. 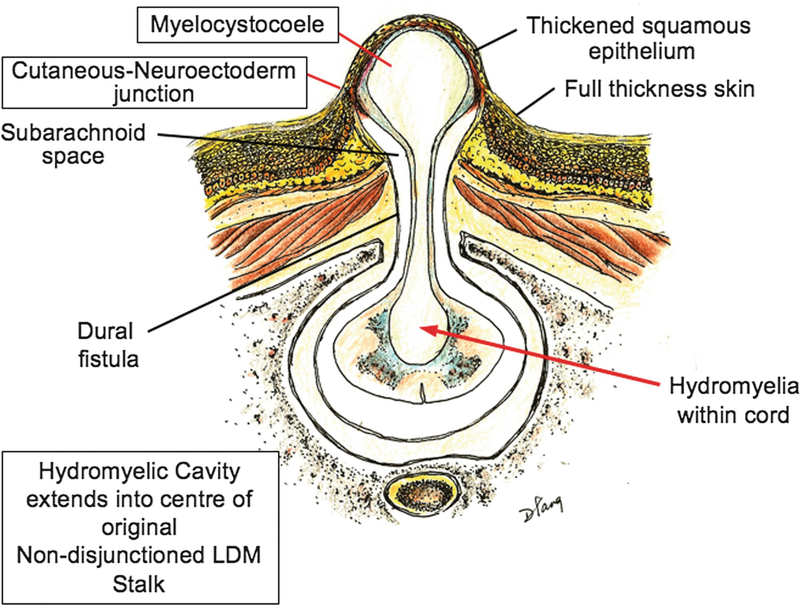 Saccular LDMs probably have the same initial embryogenetic configuration as flat LDMs, but it is soon modified by the increasing hydrodynamic pressure of cerebrospinal fluid (CSF) which pushes the liquid up along the slender dural sleeve surrounding the fibroneural stalk to distend the skin above into a fluctuant sac. The internal content of the “sac” in saccular LDMs can be of three forms. First, if there is an associated hydromyelia within the part of the cord bearing the dorsal myeloschisis, CSF may distend the potential space in the center of the fibroneural stalk into a large myelocystocoele within the epithelium-covered sac (Fig. 19). This type of segmental myelocystocoele is found in many cervical cystic lesions (Fig. 20) (Suneson and Kalimo 1979; Steinbok and Cochrane 1991; Steinbok 1995; Rossi et al. 2006). Second, in others saccular LDMs without hydromyelia, the fibroneural stalk remains compressed and narrow in its deeper course, but swells into basal neural nodules at the base of the fluid sac, while maintaining the original nondisjunctional connection with the SE (Figs. 21 and 22) (Schoenwolf 1979; Pang and Dias 1993, 2006; Steinbok 1995). Third, in the least common form of saccular lesions, normal meninges develop around the neural tube and extend around the midline fibroneural stalk as a sleeve that projects to the surface. 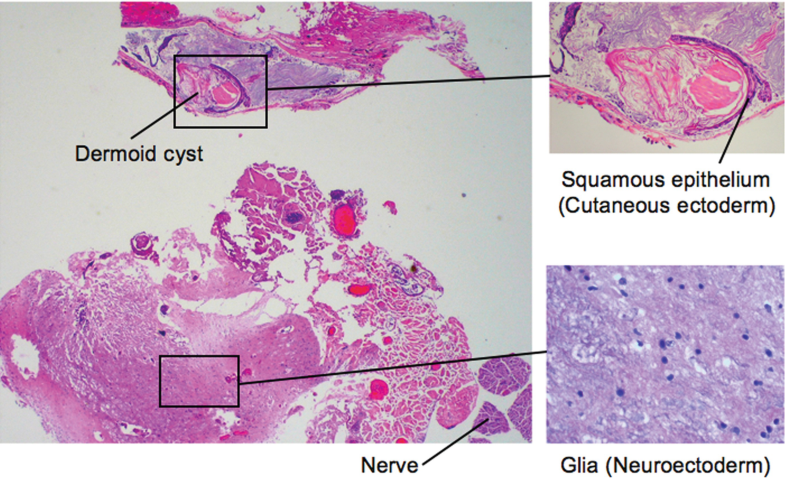 CSF squeezes into the dural fistula along the fibroneural stalk and ultimately distends the thinner, less well-supported squamous epithelial membrane into a fluid-filled, skin-based but epithelium-capped sac. Strands of the fibroneural stalk traverse the fluid cavity of the sac to reach the part of the dome bearing the crater, where the original nondisjunction occurred (Fig. 23). Saccular LDMs therefore differ from the flat (crater or pit) type only in the fact that the apical epithelium at the dome has been subjected to modification by the distending forces of CSF. Depending on the fluid tension and the thickness of the apical epithelium and adjacent skin, the sac wall varies from the coarse, purplish, corrugated cap in the not-so-turgid tubular structures in many cervical saccular lesions, to the translucent membrane topping a tense lumbar sac, and finally to the giant, diaphanous bubble. The otherwise flat LDMs with the intermittently ballooning (to straining) central crater represent a transitional form between saccular and nonsaccular lesions (Fig. 24). As with CSDST, documentation of the locations of LDMs has been far from ideal. The practical difficulty is due to the vast difference in the level of the skin lesion, the level where the fibroneural stalk penetrates dura and where it joins the dorsal spinal cord. In the largest LDM series published (Pang et al. 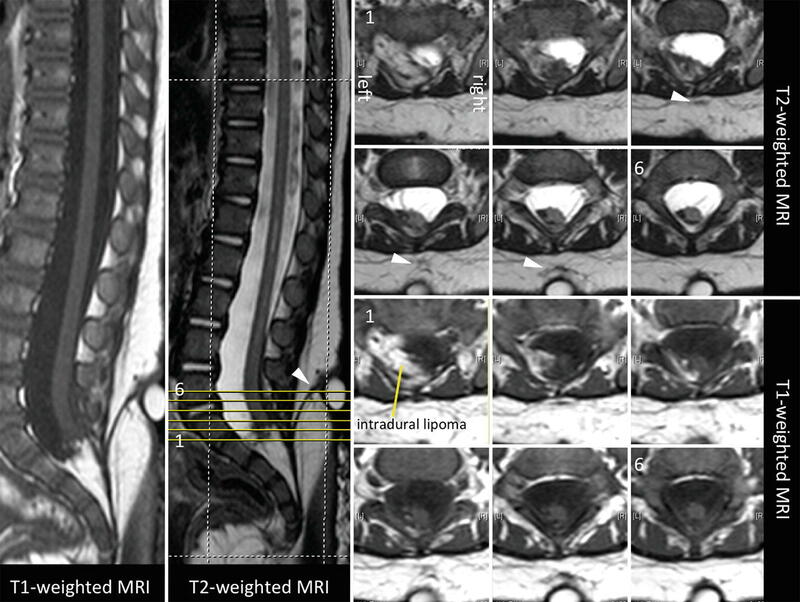 2013a), the vertebral level where the stalk joins the spinal cord was chosen as the level of the LDM because it is usually the easiest spot to recognize on MRI. The locations of the LDMs in that series are shown in Fig. 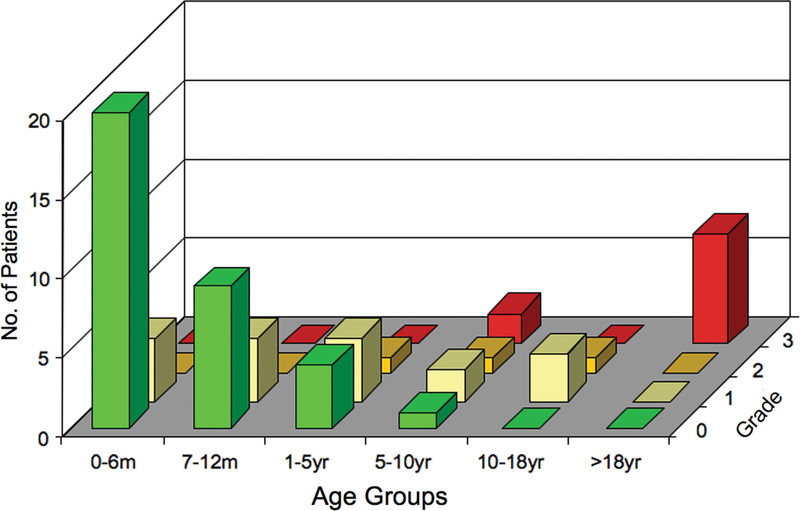 25, while the distribution of the types of LDMs is depicted in Fig. 26. 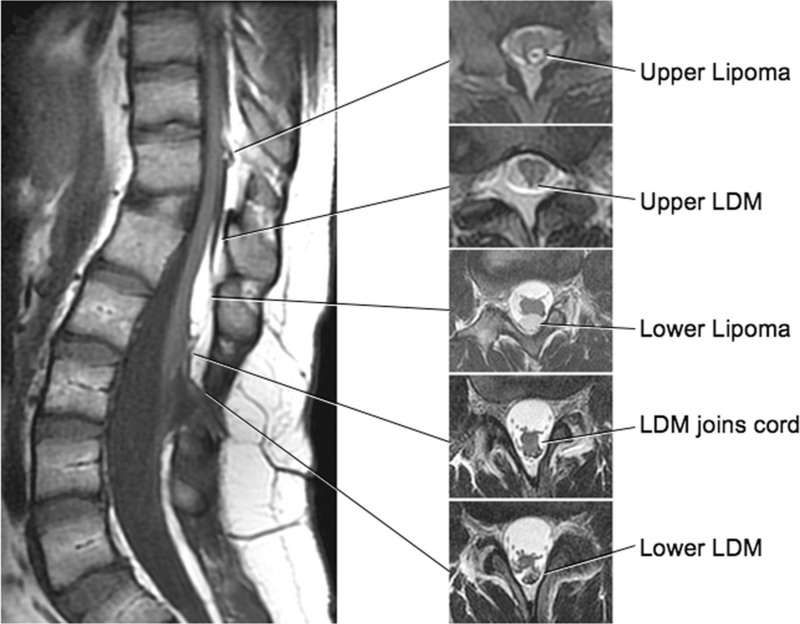 Over two-thirds of LDMs in that series are located in the lower half of the spinal cord. In all variant forms of LDM, the spinal cord underneath is tethered to the myofascial tissue on the surface by the neural stalk (Steinbok and Cochrane 1991; Pang and Dias 1993; Steinbok 1995) and by the meningeal and other mesenchymal investments condensed around the stalk. Neurological deficits develop because of this tethering effect and vary according to the location of the LDM. Histologically, the central feature of all LDM stalks is neuroglial tissue, a hallmark of the stalk’s origin from the NE. It is either in large elongated swaths containing scattered neurons (Fig. 27a), or in nests embedded in dense fibrous tissue (Fig. 27b). Also found in every stalk is a profuse network of peripheral nerves randomly admixed with the glial nests, but in some cases, nerves are seen emanating from a central core of neuron-containing glia likened to an abortive spinal cord (Fig. 28). Large nodules of dorsal root ganglion cells are seen in some cases, attesting to the occasional entrapped neural crest stem cells during formation of the neural stalk (Fig. 29). Pacinian corpuscles (Fig. 30) seen amongst some of these nerves suggest they are indeed sensory axons. Evidence of mesenchymal condensation around the lengthening neural stalk is shown by the almost universal inclusion of numerous fibrous bands, skeletal muscle, fat (Fig. 31), and prominent vascular channels sometimes in the form of a vascular glomus (Fig. 32). Glioependymal tissue lines the sac cavities of the cases of segmental myelocystocoeles (Fig. 33). 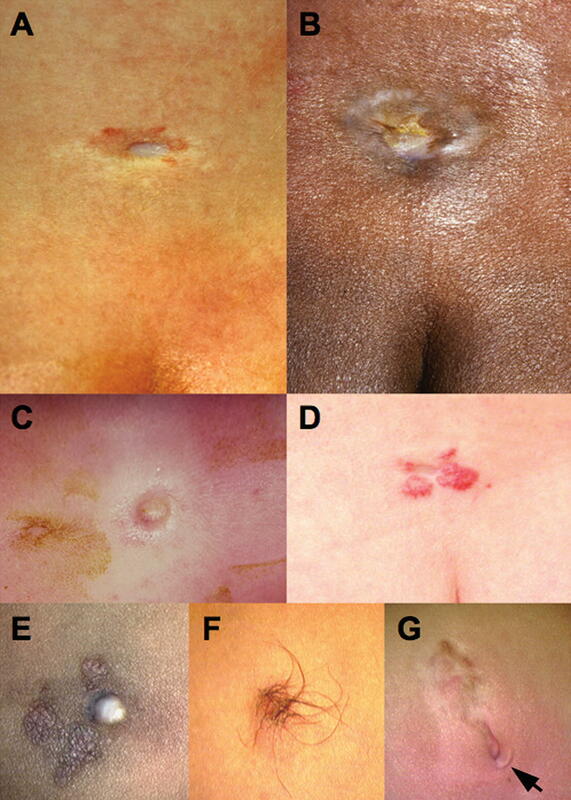 The cutaneous “cigarette-burn mark” has the histological appearance of a dermal layer with engorged vascularity, abundant nerve fibers, and an abnormal collagen fiber matrix. The unevenness of its surface is due to the ruggedness of the epidermis and dermis (Fig. 34) (Morioka et al. 2018a, b). The question is sometimes asked what constitute the minimum criteria for a diagnosis of LDM. It has been shown that there are patients with clinical and radiological features of LDM (Figs. 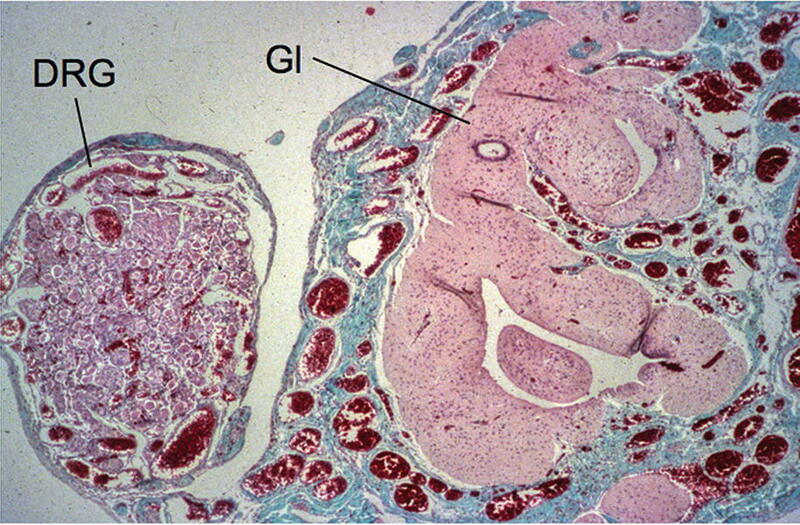 35 and 36) and most of its histological features including periphery nerve fibers, but no glial tissue within the stalk (Fig. 37) (Morioka et al. 2018a, b; Lee et al. 2017b). In many of these patients, melanocytes are also a prominent feature. 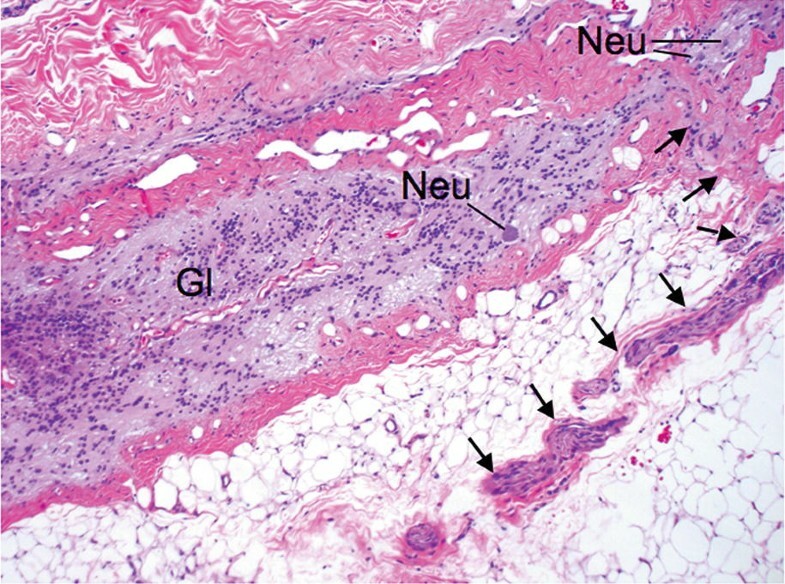 Since periphery nerves and melanocytes are neural crest derivatives, and neural crest cells are located in the primary neural tube over the dorsal midline, a nondisjunctional stalk might drag with it neural crest progenitor cells without neuroglial progenitor cells (Schoenwolf 1979; Schoenwolf and Smith 1990; Colas and Schoenwolf 2001; Theveneau and Mayor 2012). Thus, the diagnosis of LDM can probably be applied in these patients with periphery nerve fibers but no glial tissue in the stalk. Most patients with LDMs also present at a young age. In Pang et al.’s (2013a) LDM series with a total of 63 patients, the mean age at presentation of 56 children was 5.9 years; and that of 7 adults was 28.2 years. 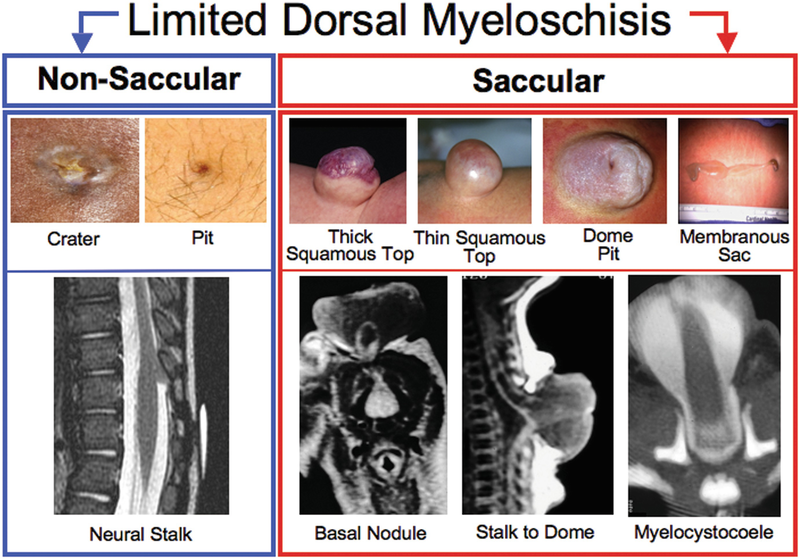 The skin abnormalities found in patients with LDM can be grouped according to their gross appearance into four distinct patterns, two flat, and two saccular, reflecting the two types of LDMs. The essential feature in all of them is a confined midline area of abnormal epithelium. 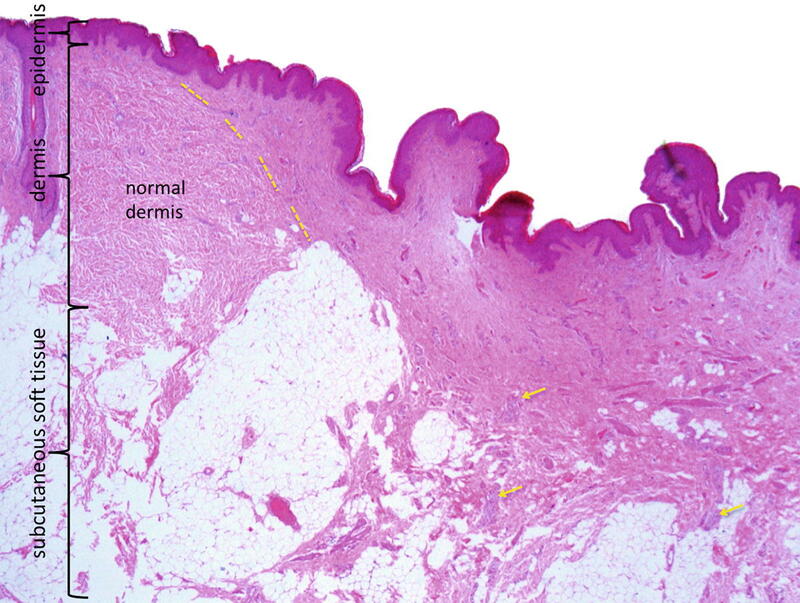 The two flat lesions are: (1) Crater: The most common skin lesion seen in flat LDMs is a sunken crater on the flat skin surface made of pinkish squamous epithelium (Fig. 38a, b), often rimmed by elevated skin margin (Fig. 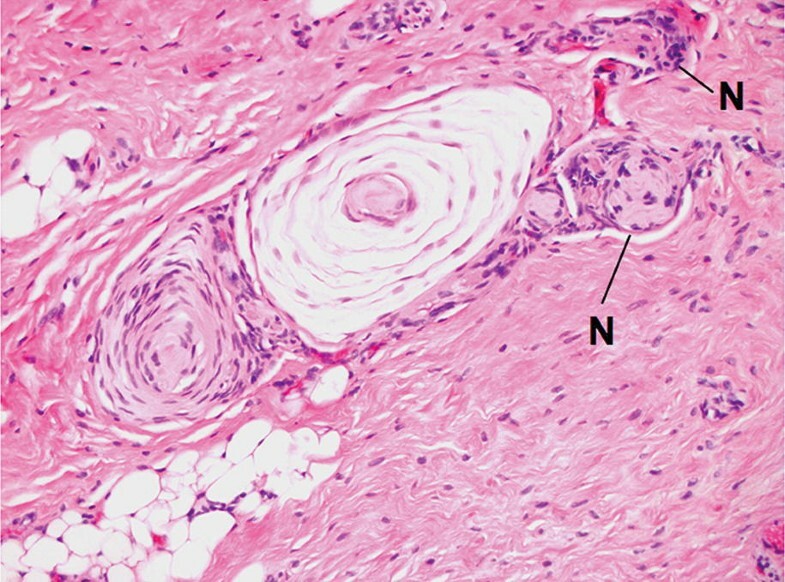 38c) and sometimes surrounded by a capillary haemangioma with irregular corrugated borders (Fig. 38d) or hyperpigmented skin (Fig. 38e). There are occasionally long hair emanating from the crater (Fig. 6f), and some craters are edged by hooded overhanging skin (Fig. 38g). In several examples, the crater is adjacent to an area of wrinkly, over-stretched skin that periodically distends with CSF on dependent posturing or straining (Fig. 39a). Very rarely, the center of the crater is adorned with a CSF-filled blister (Fig.39b). These latter examples are transitional forms between saccular and nonsaccular lesions. (2) Pit: The most subtle cutaneous signature in a flat LDM is a small midline pit with no other unusual features (Fig. 40), easily missed on cursory examination. Sometimes the pit situates within a capillary haemangioma. 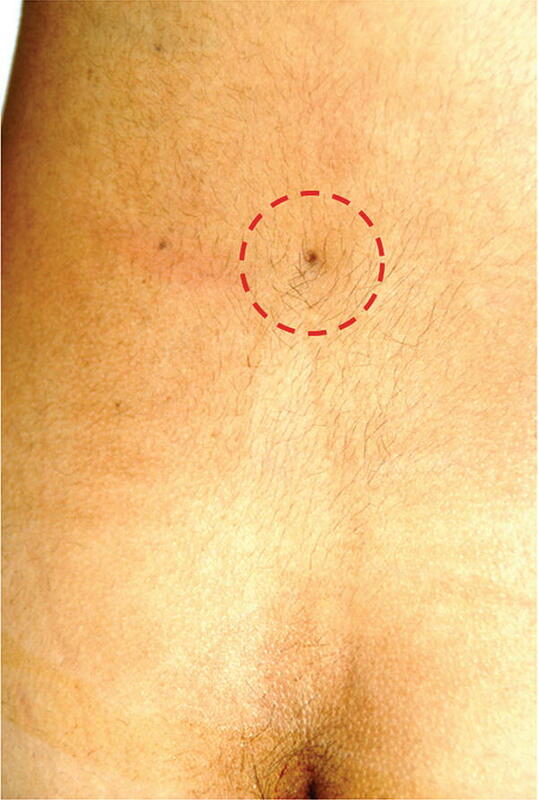 Pit lesions are usually found in low thoracic and lumbar cases. The skin pit seen in some LDM might be confused with that seen in a CSDST. The two saccular skin lesions are: (1) Skin-based Sac: This type consists of a skin-based, CSF-filled sac with a dome of tissue that is distinctly not full-thickness skin. Three subtypes can be distinguished according to the character of the dome cover. One subtype has a wide top of purplish, raw-looking, thick stratified squamous epithelium (Fig. 41a). Another subtype has a much smaller, discrete, pale, puckered crater of squamous epithelium on the dome (Fig. 41b). A third subtype has a small, almost imperceptible patch of ultra-thin epithelium on the apex of the relatively delicate skin- based dome (Fig. 41c). (2) Membranous Sac: This is the rarest skin lesion. An example is a tubular, CSF-filled sac made of a diaphanous membrane resembling thickened arachnoid, protruding through a 4 mm skin-lined dorsal defect (Fig. 42). The base of this sac has a shallow collar of skin similar to the commoner form of saccular skin lesions. The types and locations of the cutaneous lesions are summarized in Table 2. 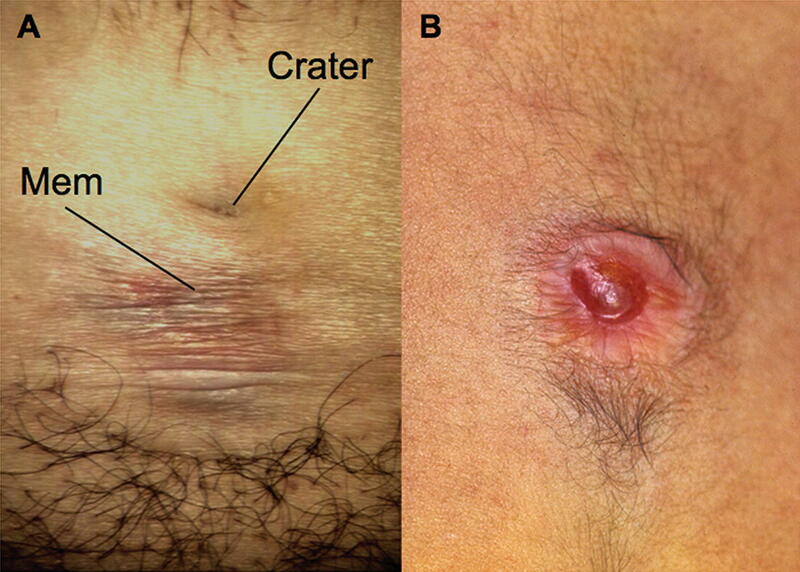 It is noteworthy that other cutaneous markers of dysraphism such as hypertrichosis, capillary haemangioma, or misaligned gluteal crease are never seen alone in LDM without the quintessential epithelial crater or pit. 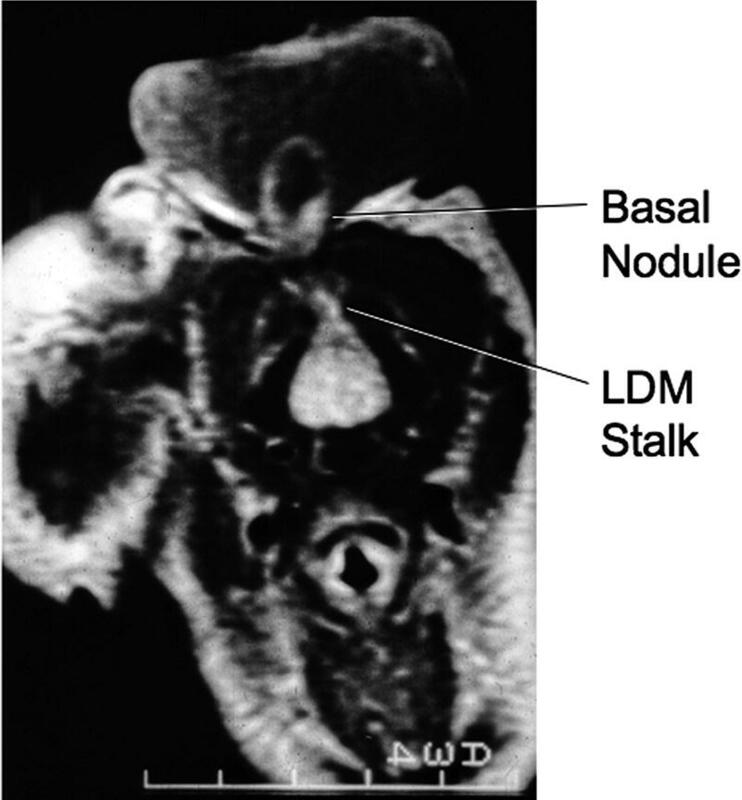 The pearly midline crater in a nonsaccular LDM thus remains the single most important diagnostic clue for LDM, especially before the development of neurological symptoms. LDMs cause neurological deficits solely by their tethering effect. 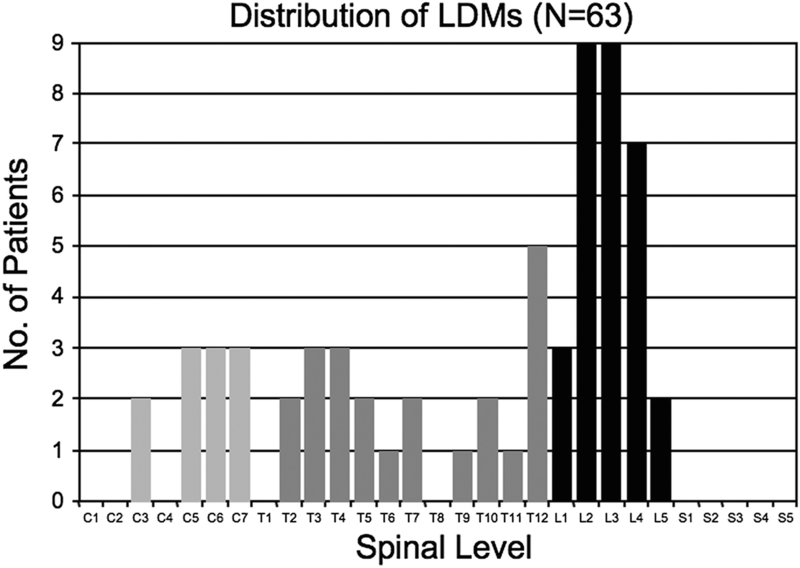 By and large, LDM patients tended to have milder disability than patients with other forms of dysraphic malformations such as spinal cord lipomas and split cord malformations. In Pang et al.’s series, half of the LDM patients are neurologically normal at presentation, which underscores the importance of the cutaneous signature as an initial diagnostic clue. Only 10% of patients had significant weakness and neuropathic bladder and the rest of the patients had mild or tolerable neurological or urological symptoms, with relatively little hindrance to their lifestyle. The types of deficits corresponding locations of the LDMs are summarized in Table 3. The proximity of tension on the relevant cord segments does seem to correspond with the kind of deficits. For example, only cervical lesions produce hand and arm weakness; leg weakness is seen in only 9% of cervical lesions, but 22% in upper thoracic lesions, 38% in thoracolumbar lesions, and 50% in lumbar lesions; and bladder dysfunction is seen in approximately 15% of lower thoracic and lumbar lesions but not in cervical or upper thoracic lesions. Lumbar LDMs close to the conus are perhaps more treacherous because they more often implicate the bladder yet are more likely to be occult. As with other tethering lesions, the probability of neurological injury increases with longitudinal growth of the spine and with time. Pang et al. demonstrated that there was a tendency for older patients with LDMs to present with more severe neurological and urological disability; and that infants and young children were more likely to be neurologically intact, while adult patients were usually significantly disabled at diagnosis (Figs. 43 and 44). 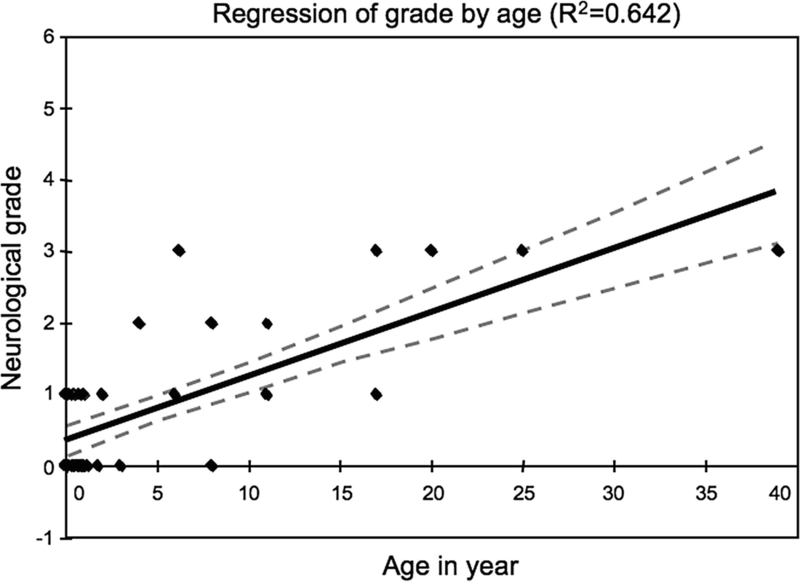 Longitudinal follow-up of four adolescents from the series who had delay of surgery of 1–9 years all showed neurological deterioration. Lesions clearly composed of the essential features of both CSDSTs and LDMs were first reported in 2013 (Pang et al. 2013a). They are rare compared to CSDSTs and LDMs. Among a series of 75 cases of LDM, there were five cases of this mixed type (Eibach et al. 2017). In another series of 51 cases that consisted of 11 CSDSTs and 40 LDMs, another five cases were observed (Lee et al. 2018). Macroscopically, a mixed lesion of CSDST and LDM can mimic either of the pure forms. Even cystic type has been observed (Lee et al. 2018). Thus, their recognition relies on histology. Two histological types are seen. In the “regular” type, the neuroglial, and dermoid elements are in their respective embryological orthodox positions, i.e., an outer tract of CSDST and an inner tract of LDM elements (Lee et al. 2018). 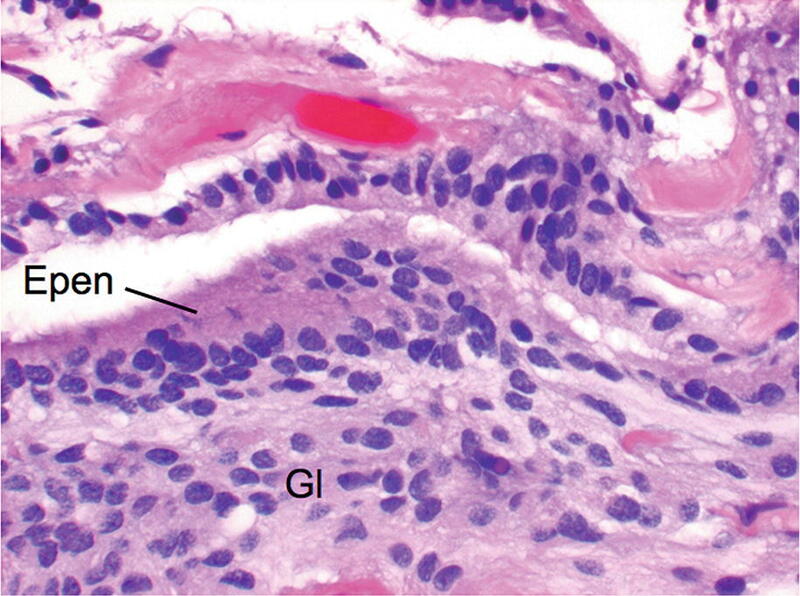 However, an “irregular” type has also been observed in which the dermal elements form squamous epithelial islands within the neuroglial tissue of the LDM tract (Fig. 45) (Tisdall et al. 2015; Eibach et al. 2017). The most important practical point with the discovery of this mixed entity is that a mixed lesion cannot be reliably exonerated at the time of surgery without benefit of histology. 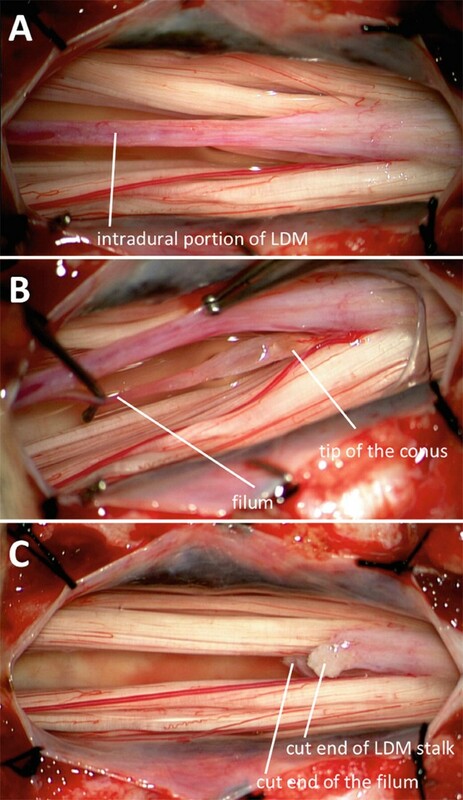 Thus, it seems prudent that in all cases of suspected LDM, the entire tract should be removed from skin to spinal cord. A postoperative follow-up MRI should be done to rule out a recurrent dermoid cyst. LDSNDs have been reported to coexist with other dysraphic or paradysraphic malformations such as spinal cord lipomas, split cord malformations, myelomeningoceles, and neurenteric cysts (Table 4) (Fig. 46). 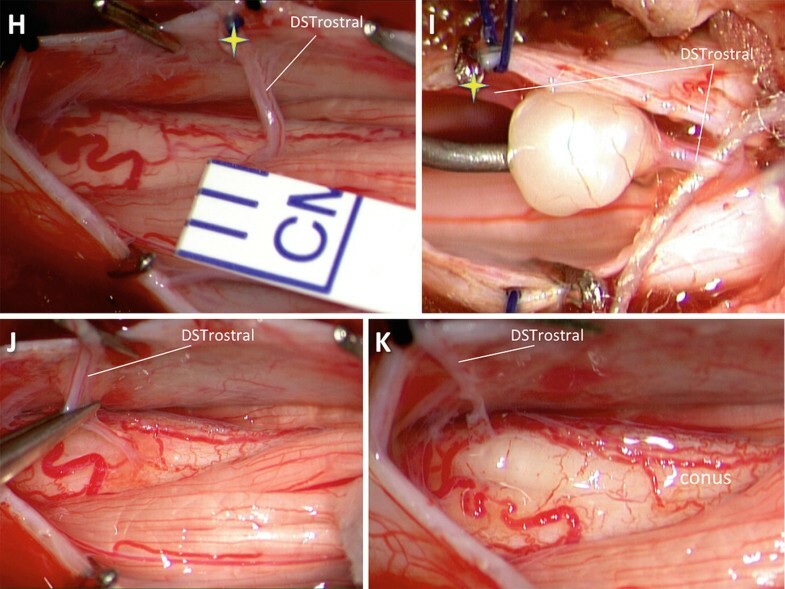 In such cases, the complex anatomy of the other anomalies usually determines the dominant features of the composite malformation, for a pure LDSND lesion is structurally subtler unless it is a CSDST with a large intradural dermoid/epidermoid cyst. The clinical manifestations of these composite lesions also follow the usual course of the associated anomalies, especially when there are only LDM elements without dermoid cyst. However, if present, the dermal elements can have major clinical impact due to their inherent risks of infection, inflammation, proliferation producing mass effect, and recurrence if not completely removed. One should therefore always be vigilant for hidden dermoid elements when dealing with spinal dysraphic lesions. As with any medical conditions, a thorough clinical history and physical examination to elicit all the relevant features are paramount. Apart from the obvious symptoms and signs related to the location and types of LDSNDs, past or active infection, changes in neurourological functions, and clues to the existence of associated anomalies should also be documented. Thus, physical examination of the whole cranio-spinal axis is needed. Urological evaluation including urodynamic studies, ultrasonography of the urinary system, voiding cystourethrogram, and urinalysis should also be performed with a low threshold of suspicion for abnormality. When a patient presents with a midline skin lesion, MRI is the diagnostic method of choice to display the anatomical details of the malformation especially regarding composite lesions. Urgent MRI is indicated if there are acute neurological deficits, or symptoms and signs of central nervous system infection. Time should not be wasted with ultrasonography, a seldom-definitive modality. Nowadays, injecting a sinus should never be performed. 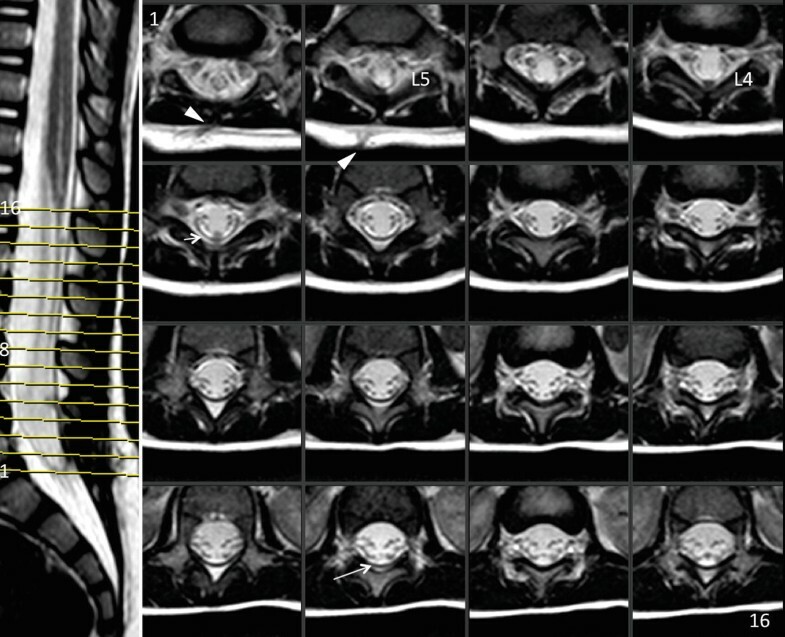 Computed tomographic (CT) myelography is only indicted if certain bony structures need to be minutely visualized in context, such as the midline bone spikes of a type I split cord malformation. Plain radiographs of the spine, however, retain its role in demonstrating any obvious bony deformity, and in planning incision for surgery. 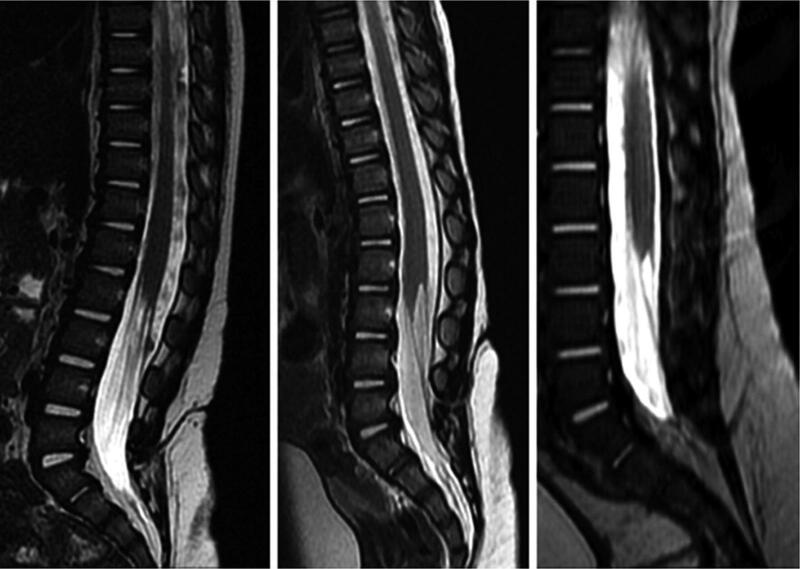 MRI of the whole spine with T1- and T2-weighted images and occasionally T1-weighted sequences with gadolinium in both sagittal and axial planes should be done. 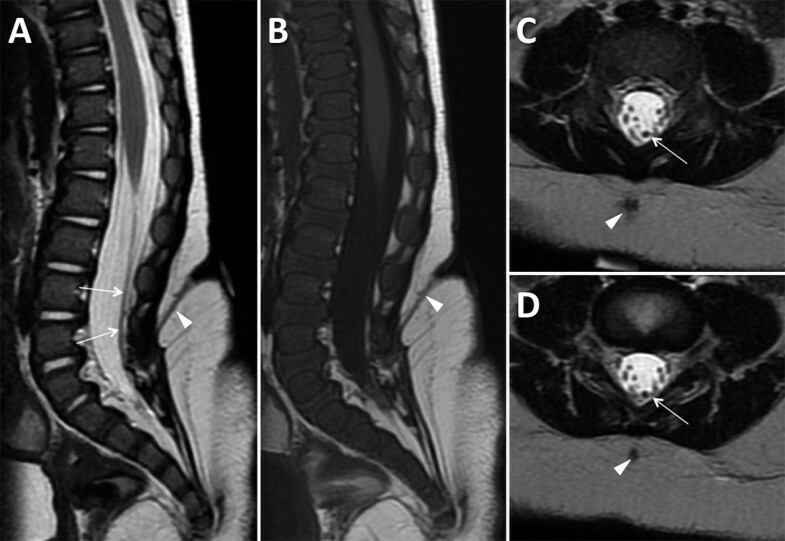 Diffusion weighted imaging sequence for cases with larger cysts should be considered. 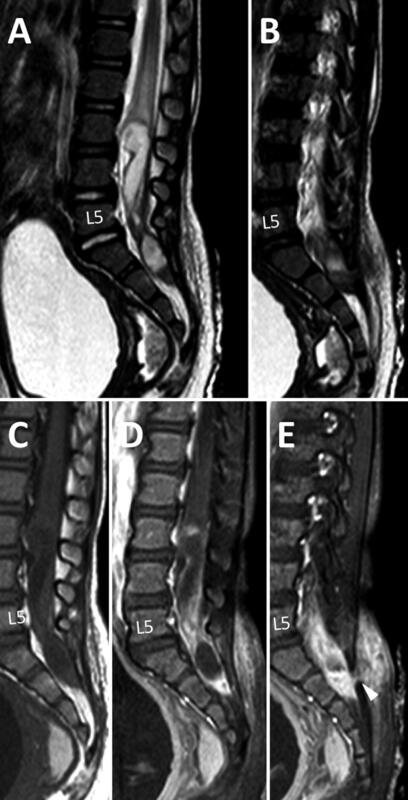 MRI features suggestive of LDSND are: (1) a tract linking the skin and the spinal cord even it does not appear continuous (Figs. 4, 5, 6, 13,); (2) posteriorly tacked-up spinal cord (Figs. 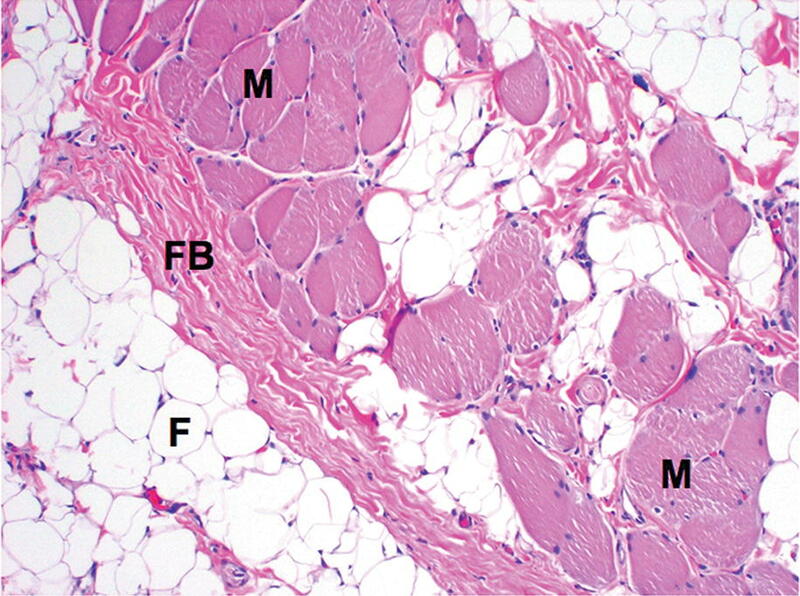 13, 14, 16, 17, and 18); and (3) a cystic lesion over the dorsal midline (Figs. 7, 15, 20, 22, 23, 24). 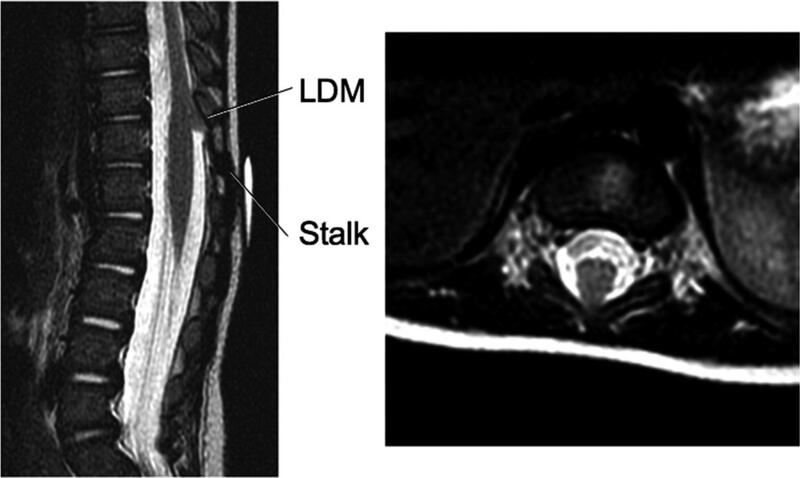 When LDSND is suspected on the MRI, the entire path of the tract must be traced from the skin through subcutaneous tissue, lamina, dura, and to the spinal cord. The constituents of the tract are interpreted as much as possible (Fig. 46): any cyst along its course or in the vicinity is particularly noted (Figs.7, 15, 20, 22, 23, and 24), as is the presence of any associated anomalies especially spinal cord lipoma and split cord malformation. 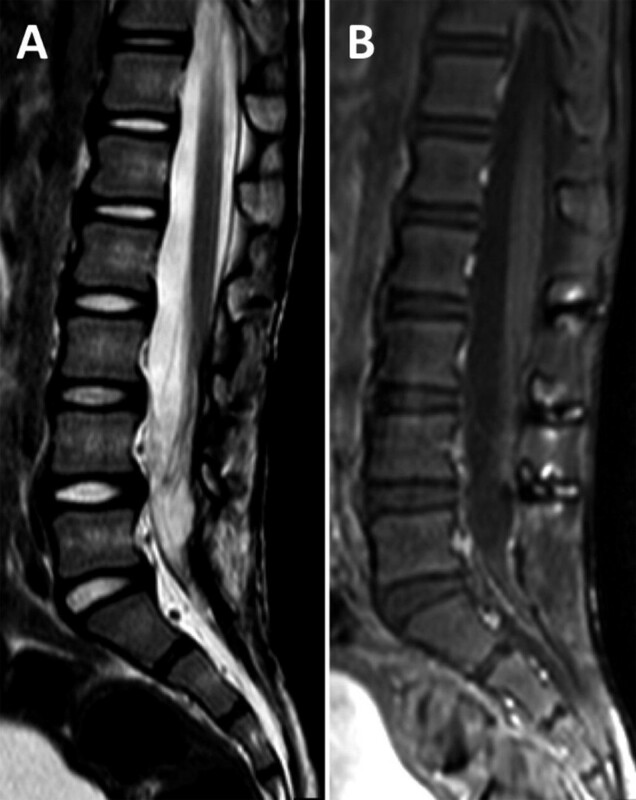 Lastly, the whole spinal axis should be surveyed for the rare coexistence of multiple LDSNDs in the same spine (Fig. 47). Nevertheless, the reliability of MRI in delineating LSDNDs is far from absolute. For example, a small tract can be below its resolution (Fig. 5) (Tisdall et al. 2015; Lee et al. 2017a), and it cannot always differentiate a CSDST from a LDM, except when the CSDST becomes inflamed and exhibits abnormal enhancement of the tract, a constituent cyst, and adjacent meninges (Fig. 4) (De Vloo et al. 2013). All are essential information for surgical planning. 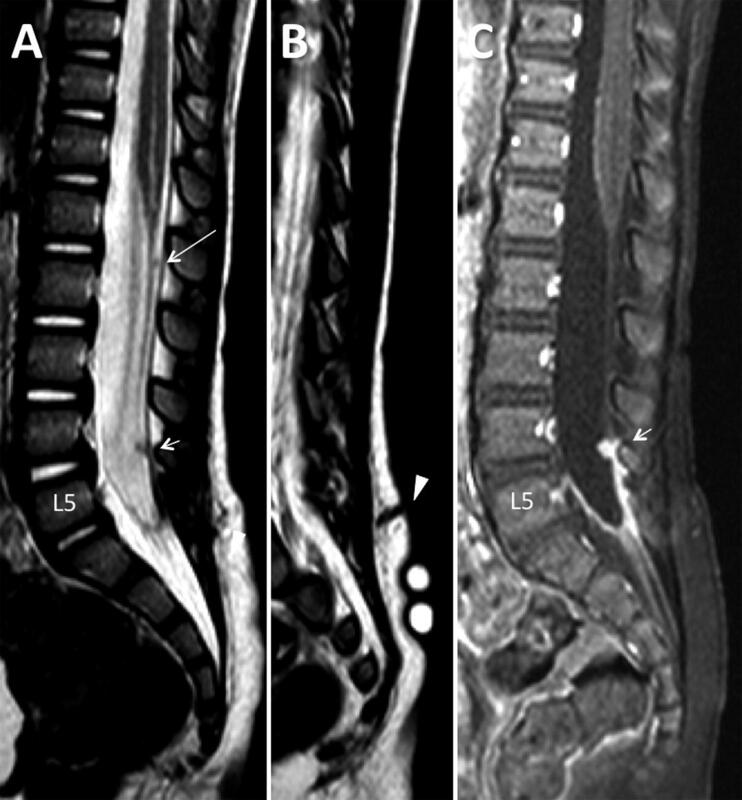 All LDSNDs can produce functional impairment by tethering of the spinal cord, while CSDST or any of its mixed forms pose additional risks of inflammation, infection, mass effect, and even secondary hydrocephalus if left untreated. Early surgery should be performed in all patients with CSDST and in symptomatic patients with LDM. In asymptomatic children with pure LDM, we also strongly recommend surgery to obviate the dreadful consequences of late and unrecognized tethering. Observation by serial MRI is probably only indicated in cases with equivocal MRI findings or perhaps in asymptomatic adults. For CSDST patients with active infection and neurological deficits, urgent surgery covered with appropriate antibiotics should be done. However, if skin infection is localized or meningitis is not accompanied by neurological deficits, surgery should be deferred until the infection has been treated with antibiotics and local therapy. 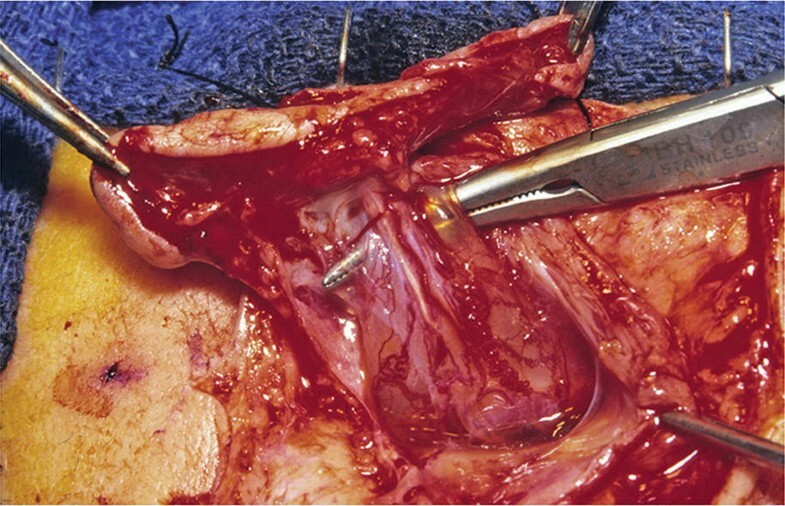 The aims of surgery in all LDSNDs are to untether the spinal cord and to remove all epithelial elements if present. For pure forms, a narrow laminectomy for exposure is usually adequate. 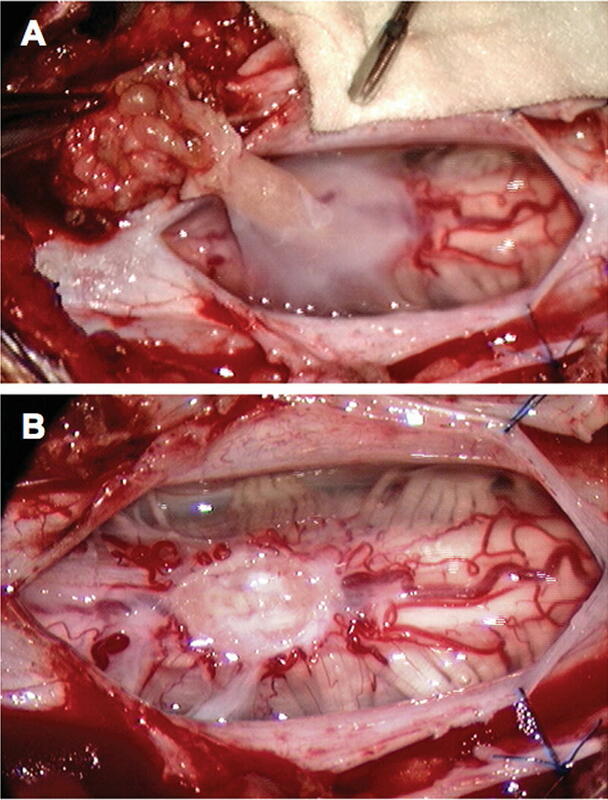 Laminoplasty is an option, and dural grafting is rarely necessary. In cases with a large intradural dermoid cyst, however, wider bony exposure is usually needed. The extent of longitudinal exposure must include the span between the skin lesion and where the tract joins the spinal cord, which is usually apparent where the cord outline suddenly becomes trapezoid instead of the normal ovoid. In uncertain cases, the skin should be widely draped to accommodate for extension of the incision. 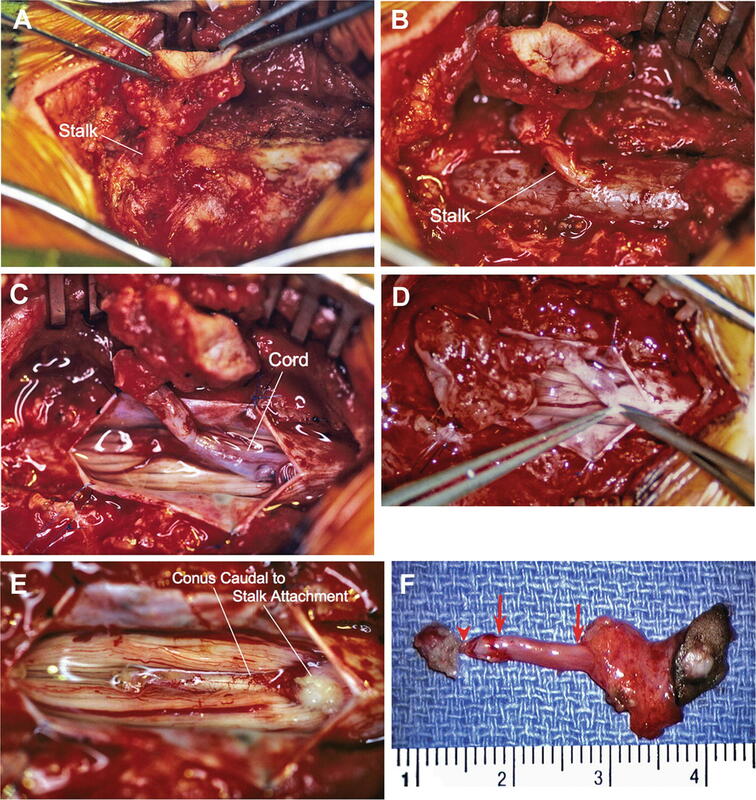 If the lesion is in the lumbosacral region, the filum terminale may be thickened and should be cut during treatment of the LDSND, so that appropriate provision must be made for more caudal exposure. The patient is laid prone, the skin ostium of the sinus tract identified, and the laminae of the planned laminectomy confirmed with radiograph (Fig. 48). Standard midline skin incision with a small elliptical island around the sinus opening is made; the tract is then traced from superficial to deep through the subcutaneous layers and deep fascia, to reach the bifid spinous process or through the interspinous ligament. The laminectomy is then carried out carefully around the tract. Dissection of the tract should be done under magnification to minimize the possibility of leaving behind residuum (De Vloo et al. 2013). The dura should always be opened unless the surgeon is absolutely certain that the tract ends outside the dura. When the tract goes intradurally, a cuff of dura may need to be excised with the tract, and the latter should be traced to its destination spot on the spinal cord. Often the tract becomes attenuated and loosely perches on the surface of the cord. Adequate bony exposure must be done without compromise to display the full extent of the tract. If a long tract truly spans many laminar levels, skip laminectomy technique should be considered in which some laminae between the tract’s dural entry point and its spinal cord attachment point are strategically kept intact. 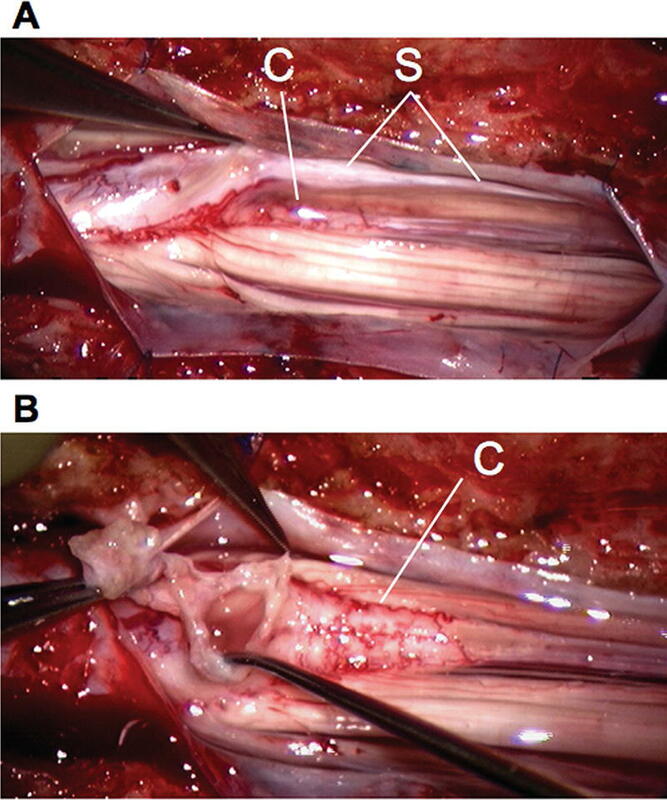 The CSDST tract can be carefully delivered in between the laminectomy gaps (Fig. 49). Afterwards, primary closure of the dura is usually possible. 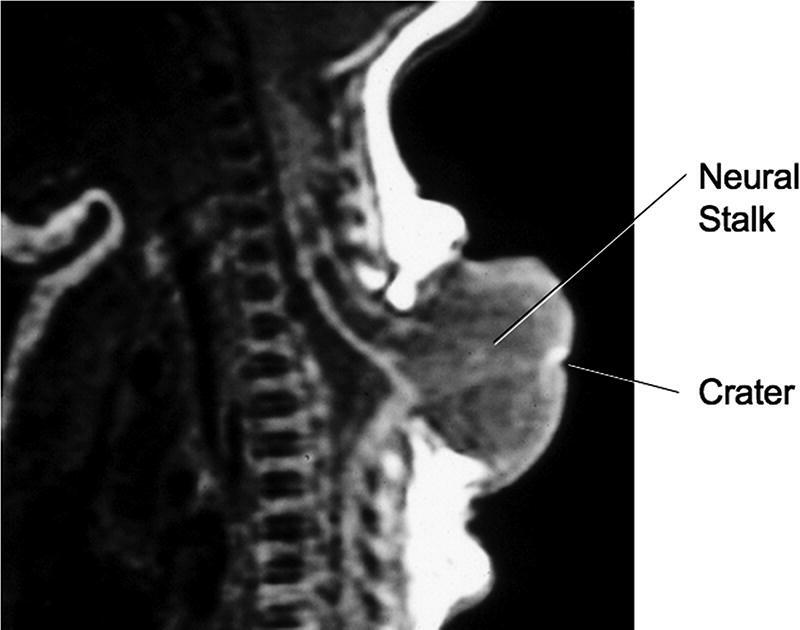 The sinus tract may expand along its course or terminate into a dermoid or epidermoid cyst. Extradurally located cysts are readily excised. 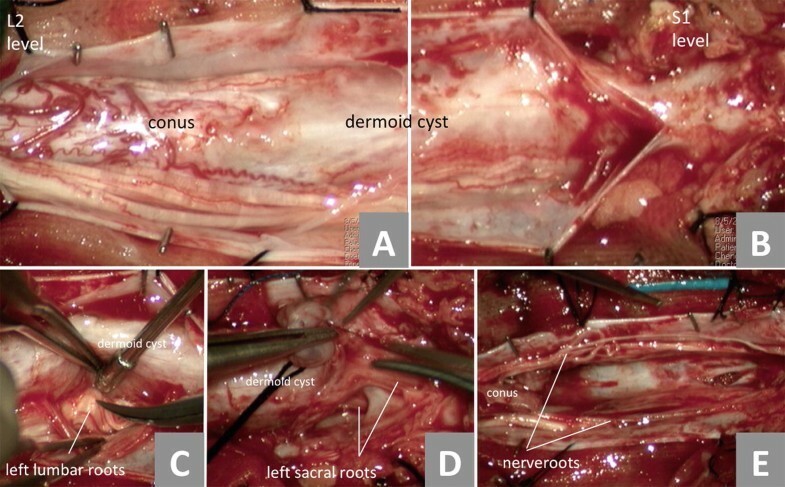 For large intradural cysts, refined microsurgical techniques are required for their complete removal since the cyst wall is notoriously adherent to nerve roots and pia (Figs. 50 and 51). Microbial cultures from adjacent areas should be obtained, and postoperative antibiotics should be given until negative growth is documented. The operative strategy for flat LDMs is similar to that for CSDST. 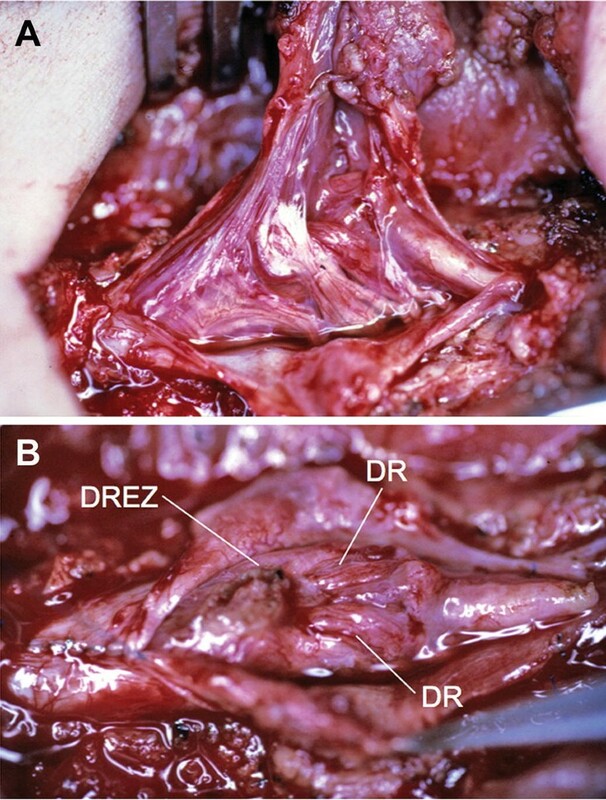 After a standard midline skin incision, the skin crater or pit is excised and the stalk at the base of the crater is carefully dissected out and followed through the discrete myofascial defect and the bifid laminae (Fig. 52a). 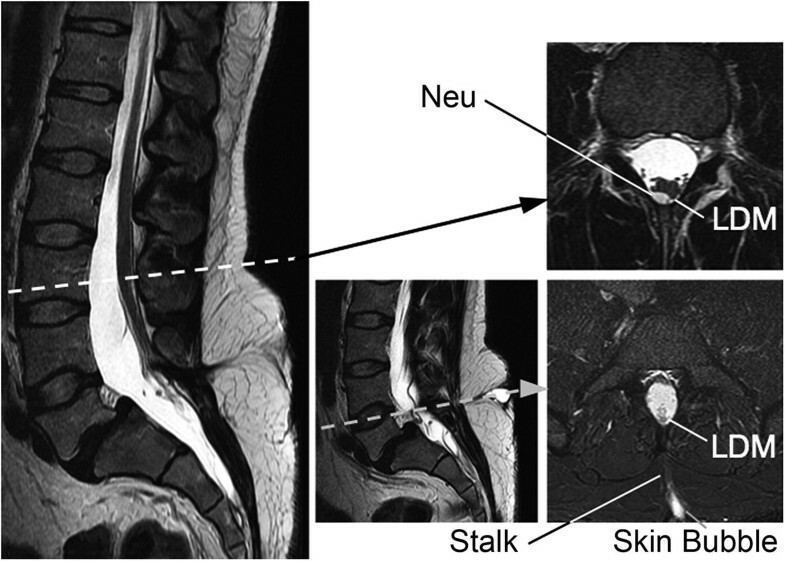 To afford good visualization of the stalk-spinal cord attachment, at least one set of laminae both rostral and caudal to the stalk-spinal cord union site has to be removed (Fig. 52b). Again, if the stalk spans multiple levels, skip laminectomy may be used. 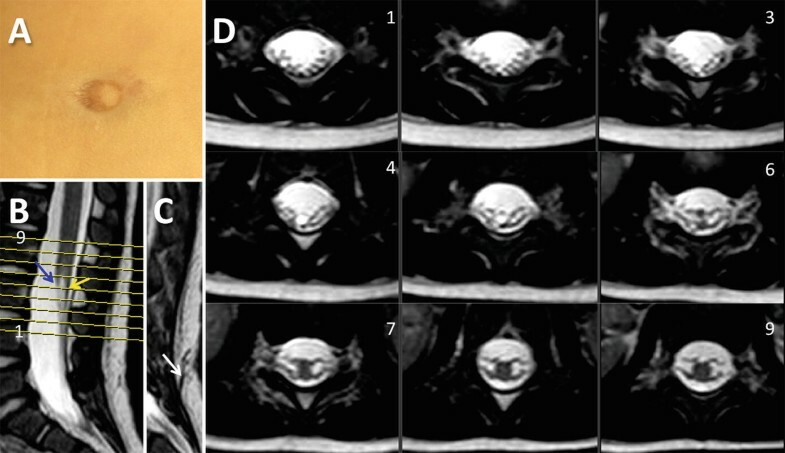 The dura is incised in the midline centered upon the entry point of the fibroneural stalk and extended according to the track of the stalk on the MRI. The usually slender stalk is most often attached to a discrete linear spot or cleft on the dorsal midline of the cord (Fig. 52c); it is simply cut flush with the cord surface (Fig. 52d, e). 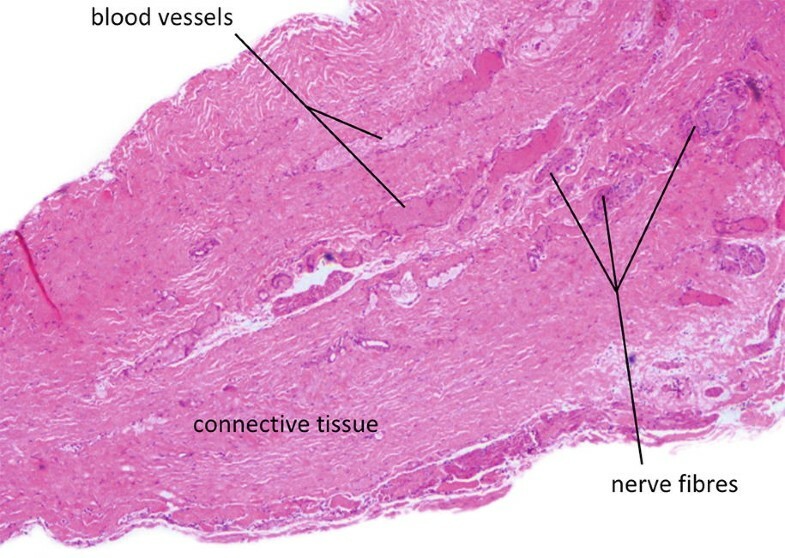 Any peripheral nerve twigs, blood vessels, and fibrous bands encircling the neural stalk are similarly cut. 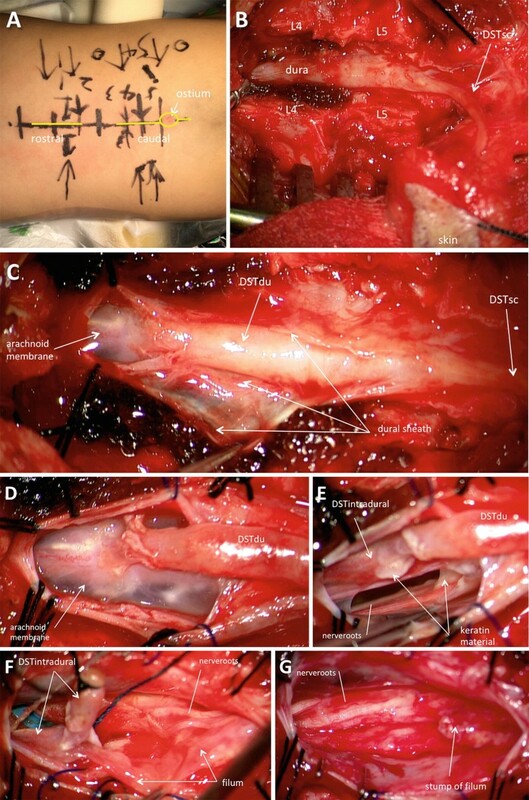 Once the intradural stalk had been disconnected from the cord, the external stalk with its skin appendage is resected en bloc (Fig. 52f). 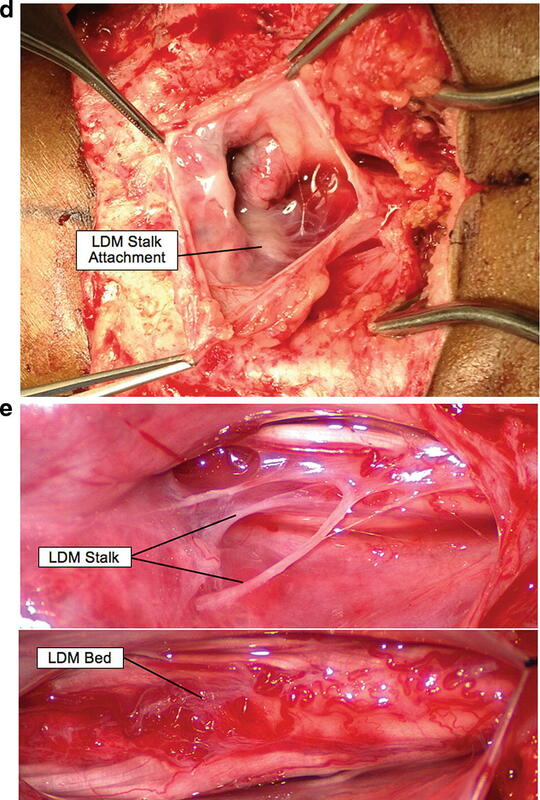 The LDM stalk may be exceedingly slender and attaches to the cord in a minute midline scar (Fig. 53), or the stalk flares out into a wider hold on the cord so that the cut edge on the cord resembles a gaping fish mouth (Fig. 54). The stalk may also contain a glomus of vascular channels (Fig. 55), or its proximal end expands into tentacles of blood vessels that crawl on to the cord (Fig. 56a, b). Rarely, the stalk attachment is stout and deceptively complex, and the dorsal roots surround it like a cuff (Fig. 57a, b). These attachments are cut flush as above but sparing the surrounding nerve root to reveal a large base of raw spinal cord (Fig. 57b). Rarely, it is necessary to approximate the pial edges of the large raw bed of a pure LDM to eliminate a potentially adherent surface susceptible to re-tethering (Fig. 58). The dura is closed primarily. The technique of dealing with the internal structures of LDMs is essentially the same whether the LDM is saccular or nonsaccular. The minor differences between the two types lay in handling the initial soft tissue dissection. For the saccular LDMs, a large skin ellipse is made at the sessile base of the sac to expose the dural funnel where the narrow dural fistula fans out to form the sac at the skin level (Fig. 59a). 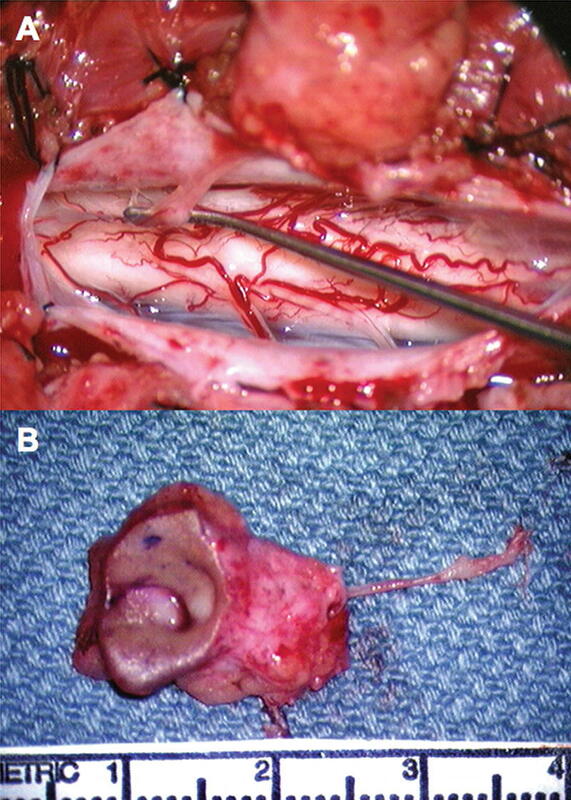 The dural fistula is then followed to the bifid laminae as with the nonsaccular type (Fig. 59b). For the basal nodule type of saccular LDM, the sac is entered at the base to locate the basal neural nodule (Fig. 59c) and the underlying fibroneural stalk within the dural fistula, where it is traced to its attachment to the cord and removed (Fig. 59d, e). Saccular LDMs with very thick stalks that traverse the cyst to reach the dome are exposed from the spinal cord side up towards the top (Fig. 60). The base of the stalk is then disconnected from the cord surface. In large saccular lesions with slender stalks that may be hard to find, the sac is opened at the dome and the neural stalk is located at the base of the abnormal skin crater, then traced to the spinal cord surface where it is transected (Fig. 61). 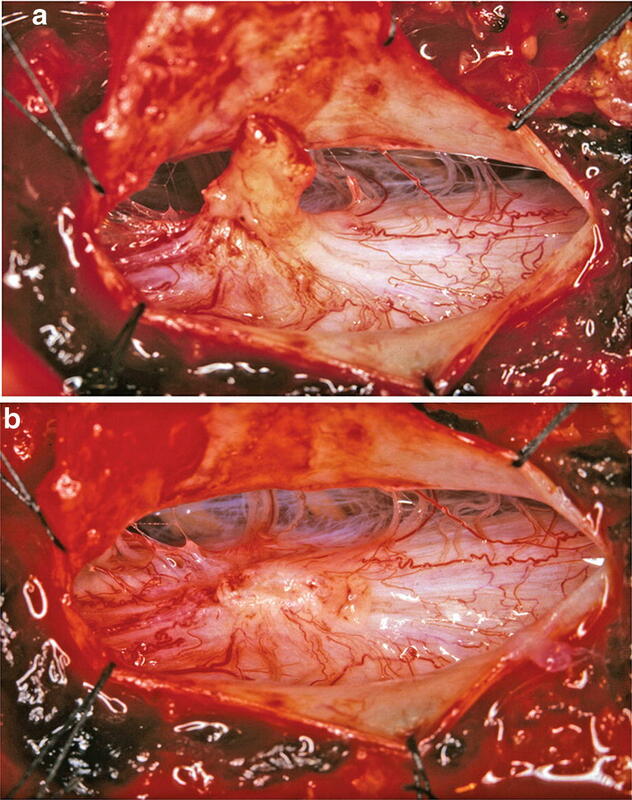 In lower thoracic and lumbar saccular myelocystocoeles, the stalk may be longer than expected and its cut end can often be traced directly into the hydromyelic center of the cord (Fig. 62). Surgical Techniques for LDSNDs Associated with Other Anomalies. 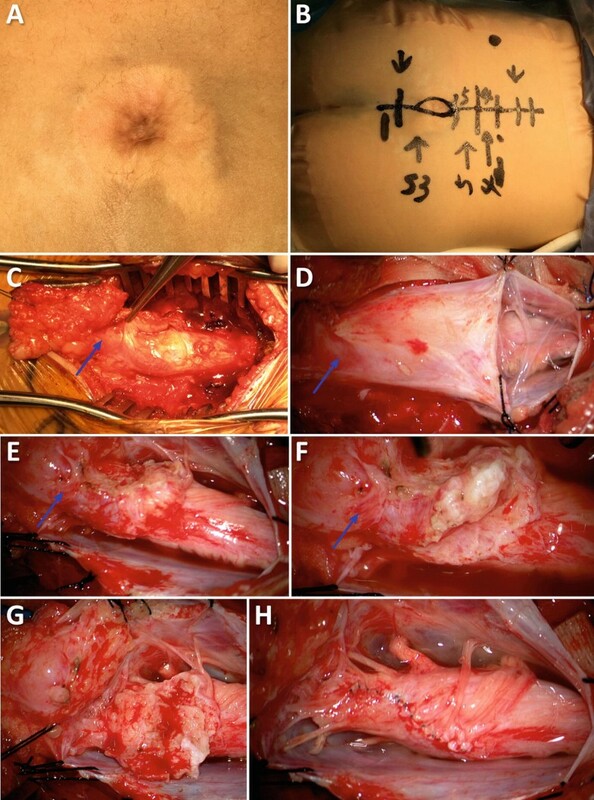 The surgical strategy in these situations is a combination of the above technique with the specific techniques suitable for the associated anomalies (Pang et al. 2013a, b). The technique for the associated anomaly usually predominates (Figs. 63, 64). The most salient point to note is the essential total extirpation of any dermoid elements in a complex lesion. The clinical outcome of LDSNDs is dictated by the clinical condition at presentation. 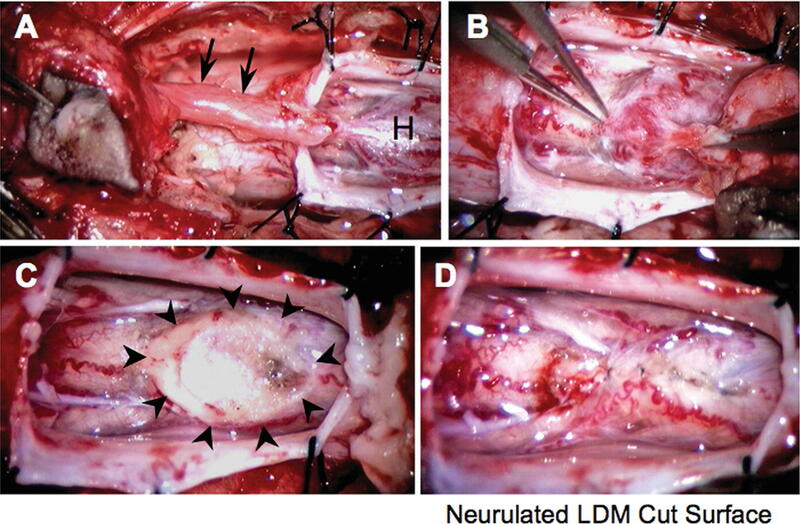 In LDSNDs without large intradural dermoid/epidermoid cysts, the surgery is usually uncomplicated; and recurrence of dermal elements and re-tethering should be extremely rare. With proper surgical techniques, most LDSND patients without neurological deficits remain neurologically normal after surgery (Wang et al. 1993; Ackerman and Menezes 2003; Pang et al. 2013a). Over two thirds of patients with preoperative neurological deficits improve after surgery; about one third will not improve though remain stable (Wang et al. 1993, Ackerman and Menezes 2003; Pang et al. 2013a). 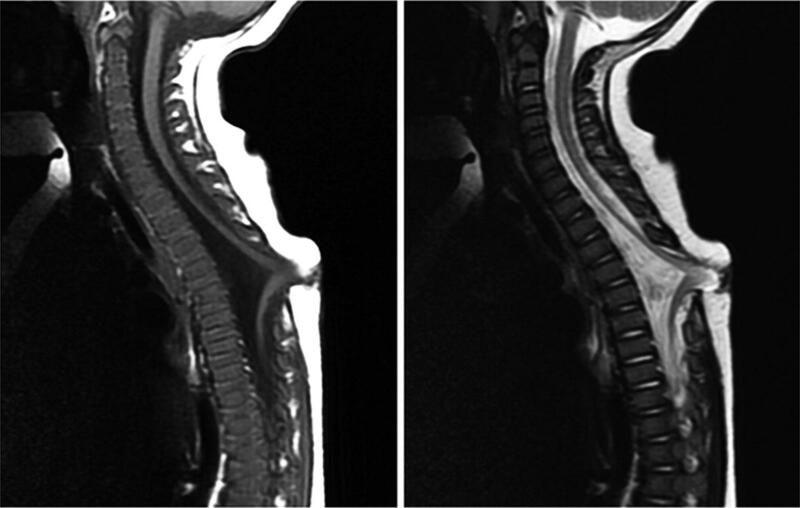 In CSDST patients with large intradural dermoid/epidermoid cysts or active infections, the results are less salubrious (Ackerman and Menezes 2003; van Aalst et al. 2006; Girishan and Rajshekhar 2016) (Tables 1 and 5). These statistics thus highlight the importance of early detection and prompt surgical intervention in LDSNDs.